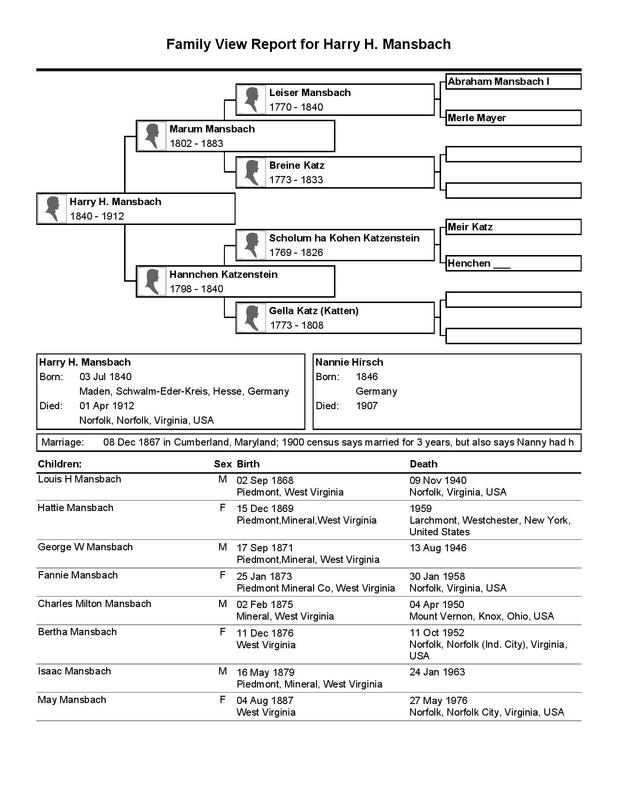 Hannchen Katzenstein, my great-great-grandfather’s sister, and Marum Mansbach had three children; I’ve already written about the two sons, H.H. and Abraham. This post will be about their daughter and first child, Henrietta Mansbach. As I’ve written previously, Henrietta married Gabriel Gump, brother of Eliza Gump, who was married to Henrietta’s brother Abraham. Like her brother Abraham, Henrietta died relatively young at 61 in 1893. In addition to her husband Gabriel, she was survived by four sons: Abraham, Louis, Harry, and Joseph. Henrietta’s children and husband worked together in the family business, a wholesale liquor distributorship, and almost all of them lived their whole lives in Baltimore. Unlike the children of her brother, however, Henrietta’s children lived lives that were not marked by tragedy. In 1887, Louis Gump, the second son, married Caroline (Carrie) Metzger. She was the daughter of German immigrants, Aaron Metzger and Teresa Hamburg, and was herself born in Baltimore in 1865. Her father was a horse dealer. Louis and Carrie had a daughter Rosalind, on October 1, 1887. In 1894, Louis was working for Gump & Sons, his family’s liquor business. According to the 1900 census, Carrie had had two other babies after Rosalind, but only Rosaline was alive as of 1900. In December 1894, Abraham, the oldest Gump son married Jennie Hamburger. She was also the daughter of German immigrants, Lewis and Rosa Hamburger; her father was a clothing merchant. Jennie was born in Maryland. 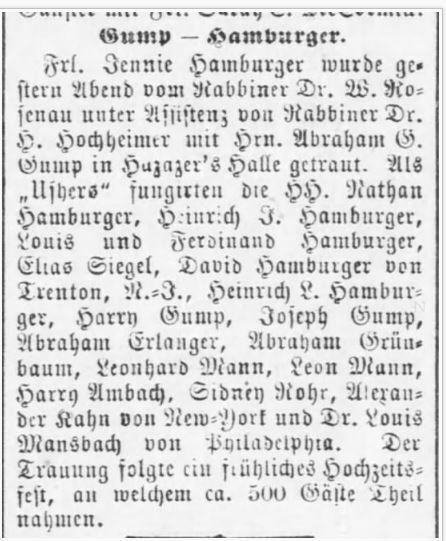 The announcement reports that Jennie Hamburger married Abraham Gump, that they were married by two rabbis, and that there was a happy wedding celebration afterwards. It also lists some of the guests, including Harry and Joseph Gump, Abraham’s brothers, and Louis Mansbach, H.H. 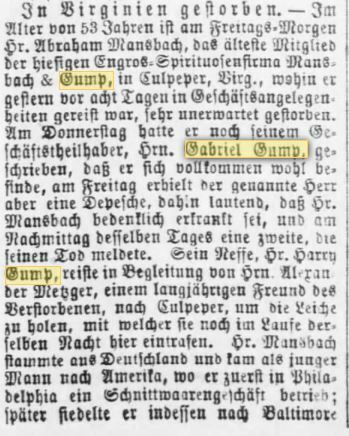 Mansbach’s son and Abraham Gump’s first cousin. Abraham and Jennie had two daughters, Etta, born in 1895, and Ruth, born in 1899. The wedding of Miss Mildred Lewith of this city and Harry Gump of Baltimore took place at the synagogue B’nai B’rith on South Washington Street at 7:30 Wednesday. The affair was the grandest Hebrew social event of the season. Everyone knew it was going to be a grand affair, but none thought it would be such a brilliant and gorgeous one, and surrounded by so much beauty. The bride and groom left on the midnight train for Old Point Comfort and will remain there for a week. They will go to Washington, Baltimore, Philadelphia, and New York, and finally will return to this city and take up their residence in handsome apartments at the Sterling Hotel until late next fall, when their home in Baltimore will be ready for them. The fact that the bride will not at once make her home in another city will be good news to her many friends, for she is a deservedly popular young lady and her friends do not want to part with her. A few observations about this wedding article. First, Mildred must have come from quite a wealthy family. Mildred was a native of Wilkes-Barre, and her parents, Lewis Lewith and Josephine Freeman, were immigrants from Nepomuk in what is now the Czech Republic, but was then part of the Austria-Hungary Empire. Lewis, like Harry’s father Gabriel Gump, was in the wholesale liquor business in Wilkes-Barre. I assume that that is how the connection was made between Harry and Mildred. Mildred and Harry did not have any children. Second, we think that social media today reveals too many intimate details about people’s lives, but even in 1899 the public was fascinated with the private lives of others. I also wonder how those whose marriage announcement followed this one in the Wilkes-Barre paper felt about their relatively meager announcements. Thirdly, I don’t know what happened to the home being prepared for them in Baltimore, but as far as I can tell, Harry and Mildred never really left Wilkes-Barre, I am sure to the delight of her many friends. 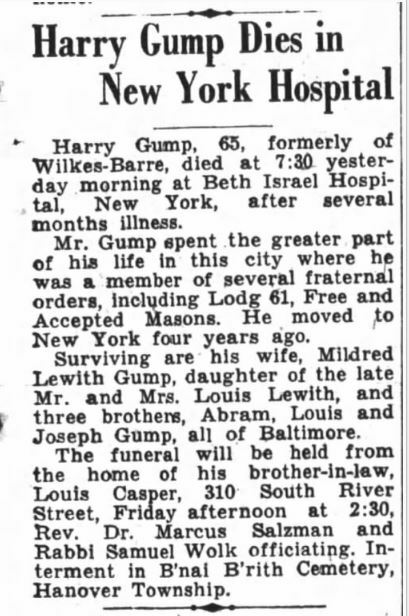 Thus, as of 1900, three of the Gump sons—Abraham, Louis, and Harry— were married. Their father Gabriel was living in Baltimore with Louis and his family in 1900, and the youngest son Joseph was living with them as well. Abraham was living with his wife Jennie and daughters in Baltimore also, and only Harry was living elsewhere—in Wilkes-Barre. Joseph, the youngest son, married Francella (sometimes called Frances) Kohler sometime before June 25, 1907. I cannot find any official or unofficial reference to the date of their marriage, but on that date a newspaper item appeared in the Baltimore Sun reporting that “Mrs. Joseph Gump” would spend July at the Blue Mountain House, a resort in the Blue Ridge Mountains near the border of Maryland and Pennsylvania. I wondered how Joseph Gump met Francella Kohler. 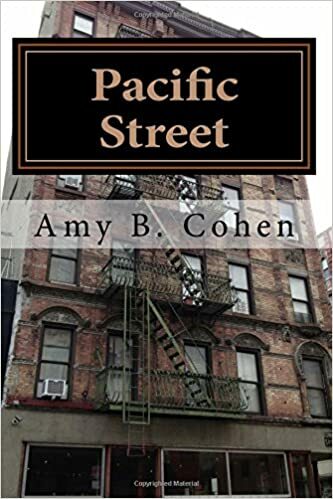 She was born in New York City in 1875 and lived in Brooklyn until she was about five when her parents, David Kohler and Jane Kurtz, moved to Baltimore. David was a merchant, sometimes selling clothing, sometimes tobacco products, and Francella was one of eight children. Her mother Jane died in 1880, and at some point her father David remarried, and by 1891 the family had moved to Savannah, Georgia. So how did Joseph Gump meet Francella if she had moved from Baltimore by the time (and perhaps before) she was sixteen? He was four years older than Francella. Perhaps they’d met while she and he were both growing up in Baltimore or their families were friendly. Also, I found two items of social news in the Augusta, Georgia, newspaper, one from 1900 and one from 1902, reporting that Joseph Gump of Baltimore was staying in that city. Although Augusta is almost 140 miles from Savannah, perhaps there was some event that brought Joseph and Francella together while he was visiting Georgia. 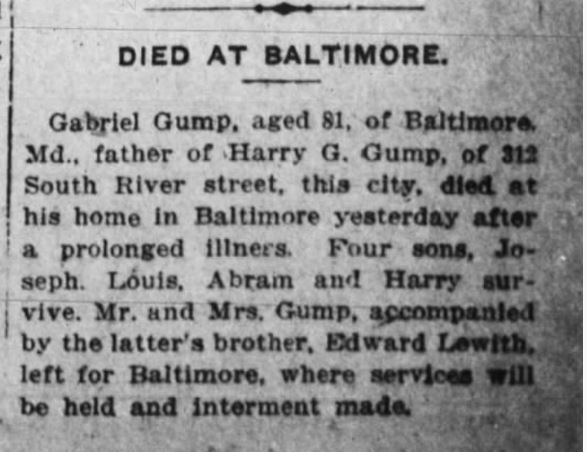 At any rate, Joseph and Francella married by June 1907, and on November 17, 1908, their son George Gump was born in Baltimore. In 1910, Joseph, Francella, and George were living in Baltimore, and Joseph was working in the family liquor business. Francella’s father David Kohler, widowed again, was living with them. Joseph’s father Gabriel was still living with his son Louis and his family in 1910. Gabriel was retired, but Louis was still working in the liquor business with his brothers. Abraham also was still in the family liquor business, living in Baltimore with his wife and daughters. 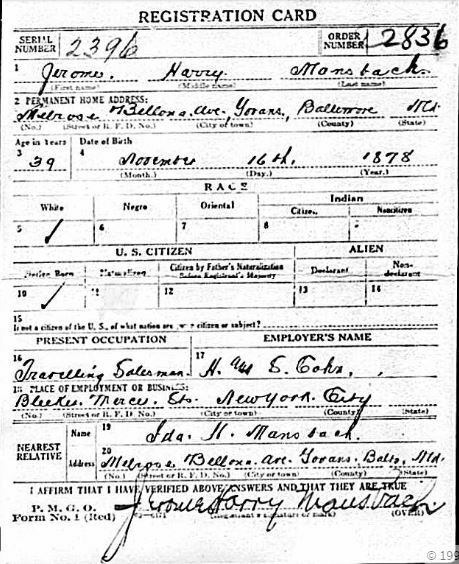 Harry continued to live in Wilkes-Barre with his wife Mildred, and although the entry for him on the 1910 census is not legible, according to the 1910 Wilkes-Barre city directory, he was working as a commercial traveler, i.e., a traveling salesman. Gabriel was survived by his four sons and four grandchildren: Rosalind, Etta, Ruth, and George. In addition, when Gabriel died, he was already a great-grandfather. His granddaughter Rosalind, daughter of Louis and Carrie (Metzger) Gump, had married Milton Wertheimer, who was born in New York in 1883, but was living in Baltimore in 1910 with his parents and working in his father’s manufacturing business. Rosalind and Milton had a son, Emanuel, in 1912. A second son, Milton Wertheimer, Jr., was born just five months after Gabriel’s death in 1915. 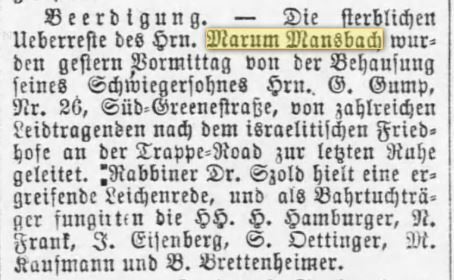 As seen in the last post, the family of Abraham Mansbach had prospered despite Abraham’s early death in 1887 at age 52. Unfortunately, his DNA would cast a long shadow on his children and grandchildren. The last post ended in 1915 when Abraham’s son Jerome married Ida Herzog. At that time Jerome and his sister Mollie and her family were all living in Baltimore. 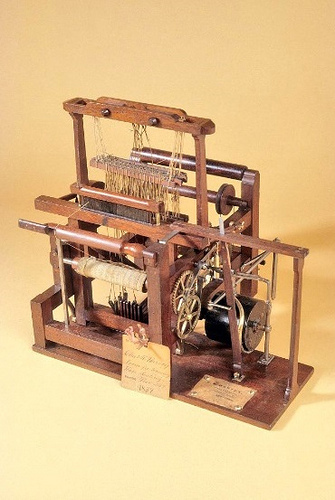 Mollie was married to Herman Kerngood, a successful businessman, the owner and president of a button and metal fastening manufacturing business, Alma Manufacturing. They had two sons, Allen and Morton Kerngood. The World War I draft registrations for the Mansbach and Kerngood men revealed more details of their lives as of 1917-1918. Jerome Mansbach was living in Baltimore with Ida and working as a traveling salesman for H & S Cohn of New York City. In 1920, Jerome and Ida were living with Ida’s father Charles and her sister and brother-in-law in Baltimore; Jerome continued to work as a traveling salesman. Jerome’s nephew Allen Kerngood was living in Baltimore with his wife, Myrtle Folb, and one child (a daughter, Marian, born in 1913), and he was working as a superintendent at his father’s company, Alma Manufacturing. Allen’s younger brother Morton Kerngood was working as an assistant superintendent at Alma Manufacturing and was now married and also living in Baltimore. He was married to Myra Spandour, a Virginia native. Meanwhile, the family matriarch Eliza (Gump) Mansbach, Abraham’s widow, relocated to Atlantic City by 1920. Eliza is listed as residing at Gerstel’s Hotel in both the 1920 and 1921 Atlantic City directories. Although Eliza still had one brother, Jacob, and her two children and her grandchildren living in Baltimore, something prompted her to move by herself to Atlantic City. 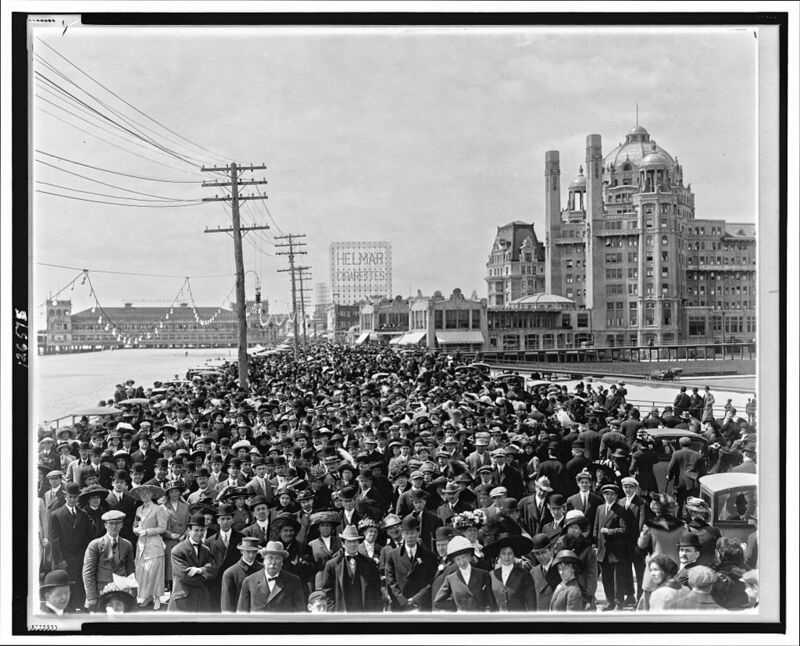 Of course, as I’ve written earlier in my posts about the family of Simon Schoenthal, the 1910s were the heyday of Atlantic City’s popularity. But it still strikes me as somewhat surprising that Eliza, a widow in her seventies, would have moved away from her children and grandchildren. I was able to locate Mollie and Herman’s sons on the 1920 census records. Their older son Allen and his wife Myrtle were living in Baltimore with their daughter Marian; Allen continued to work at Alma Manufacturing with his father. Allen and Myrtle would have a second child, Herman (II), in 1922. Allen’s brother Morton was also working at Alma Manufacturing; he and his wife Myra had a child, Morton, Jr., in 1921. They were also living in Baltimore. Thus, it seemed that the family was thriving and that life was treating them all well in the 1920s. But fortunes started to change in 1929. 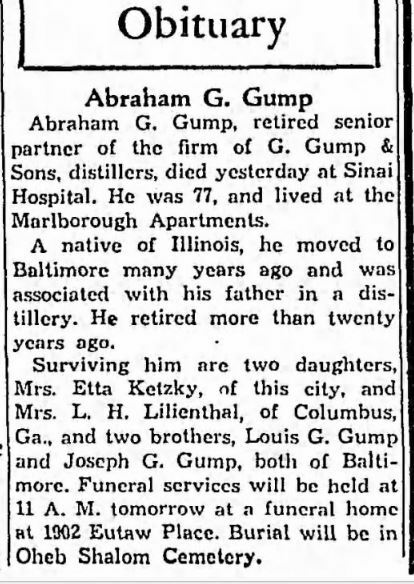 On September 1 of that year, Eliza Gump Mansbach died at age 86 and was buried with her husband Abraham at Oheb Shalom cemetery in Baltimore; she had outlived him by 42 years. Her children did not outlive her for as many years. 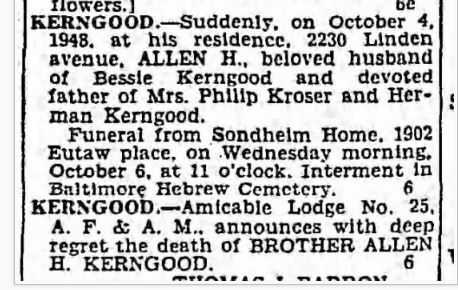 Although her daughter Mollie (Mansbach) Kerngood is listed with her husband Herman in the 1930 Baltimore directory, she is not listed with him on the 1930 census. He is listed as living at the same address as that listed in the 1930 directory, but Mollie is not included. 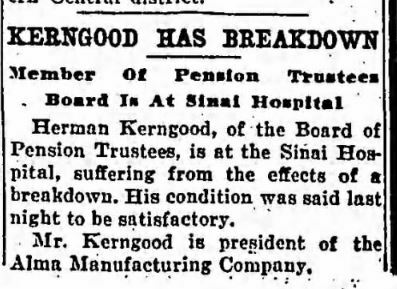 Four months later, the newspaper reported that Herman had been “dropped” from the Board of Pension Trustees by the current mayor; the article seemed to suggest that this was for political reasons, as Kerngood was a Republican and the new mayor a Democrat. Then just a month later, on August 11, 1931, Mollie Kerngood died. She was 64. 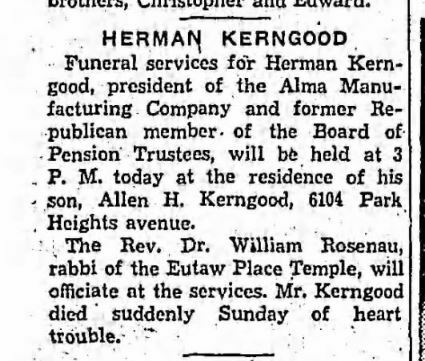 There was no obituary, just this short death notice, describing her as the “beloved wife” of Herman Kerngood. I can’t quite put all these pieces together, but the timing of all of these events seems to be too odd to be coincidental. 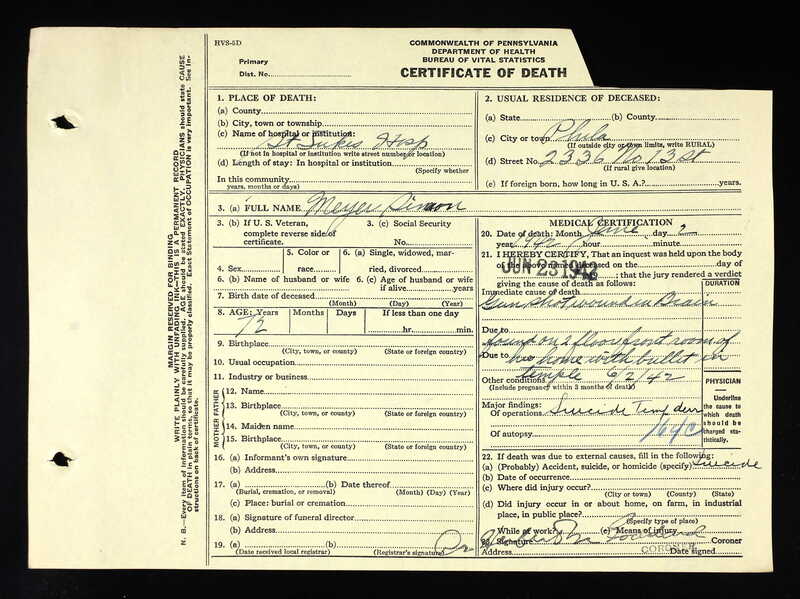 Had Mollie taken ill sometime before April, 1930, when the census was taken? Had Herman’s breakdown been related to his wife’s illness? Had the mayor removed Herman because of this breakdown, not just for political reasons? What would you infer from this series of events? Was it the Depression, not illness, that caused the family’s problems? Some other issue? The funeral notice states that he died suddenly of heart trouble. When his estate was probated a month later, it was valued at $209, 393. His sons, Allen and Morton, took over the business of Alma Manufacturing. Myrtle was only 47, and her children Marian and Herman were 24 and 15, respectively, when she died. Morton’s son Morton, Jr. was seventeen when his father died in 1939; he lost his mother, Myra Spandour Kerngood, in 1942, leaving him an orphan at twenty-one years of age. Thus, the family of Mollie (Mansbach) Kerngood had far more than their fair share of tragedy in the ten years after Mollie died in 1931. First, Herman died in 1932, and then their son Morton died as well as both of their daughters-in-law. The only surviving member of the family aside from the three grandchildren was Allen Kerngood, who died on October 5, 1948, when he was only 59. According to his death notice, he died suddenly. 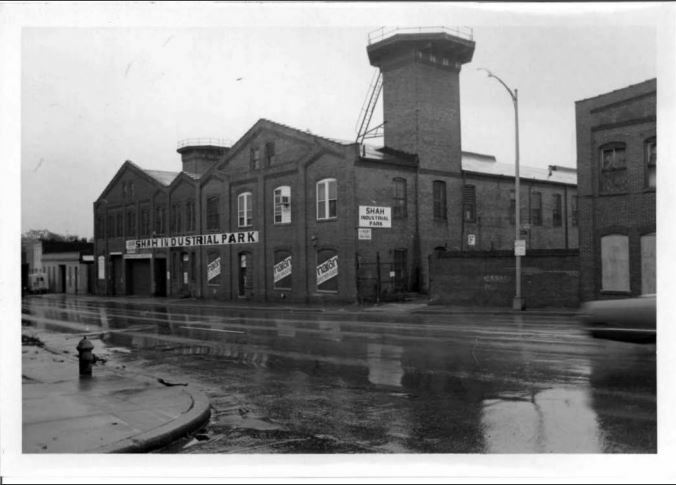 As for the Kerngood family business, its original facility in Baltimore closed in 1940, and the business was sold to the North and Judd Manufacturing Company of New Britain, Connecticut, in 1946. 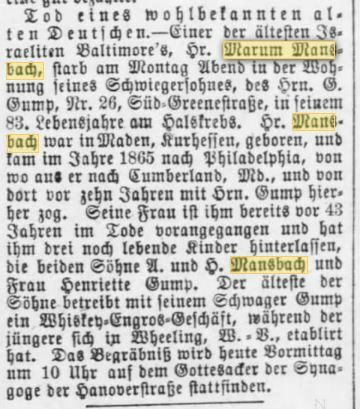 Meanwhile, Jerome Mansbach, Mollie’s brother and the son of Abraham and Eliza (Gump) Mansbach, had continued to live with his wife Ida in Baltimore. In 1930, Jerome was still a traveling salesman, but in 1940 when he was 62 he did not list an occupation on the census. 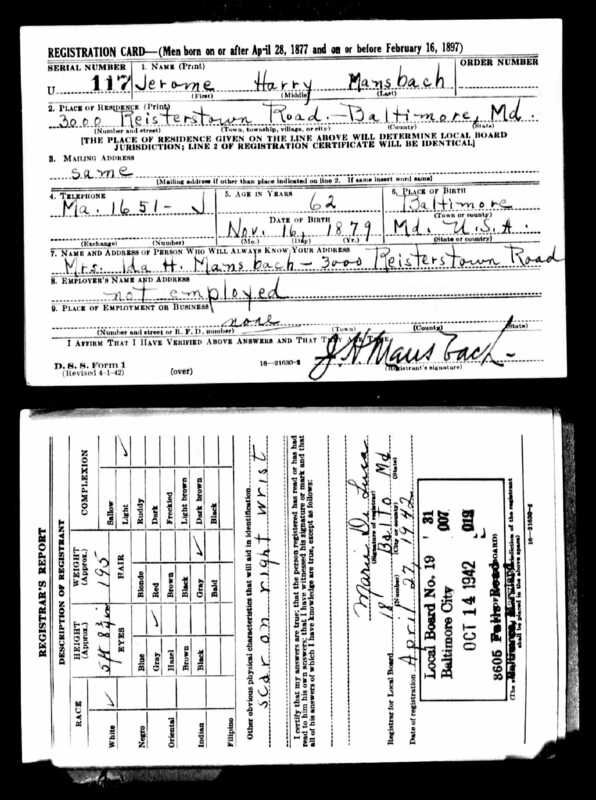 His 1942 World War II draft registration confirms that he was no longer employed. 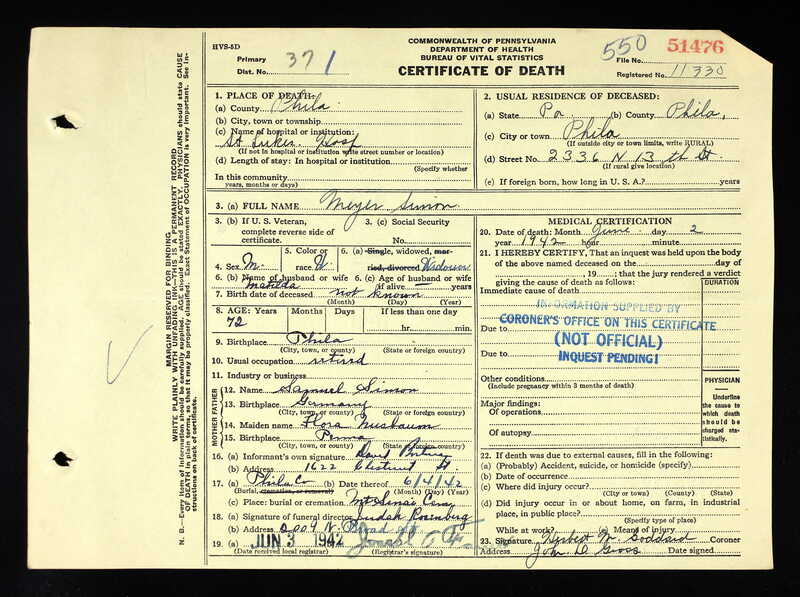 Jerome died on December 20, 1942; he was 63 or 64 (records conflict as to whether he was born in 1878 or 1879). Like his nephew Morton and his father Abraham, he died suddenly. His wife Ida died two years later in 1944 when she was 72. Jerome and Ida had not had any children. Longevity does not appear to have been in the genes of Abraham Mansbach and his children. He died at 52; his daughter Mollie and his son Jerome both died when they were 64, and Mollie’s two sons died at even younger ages: Morton was 49, Allen was 59. Although Eliza Gump Mansbach had lived into her eighties, it appears that neither her children nor her grandsons were as fortunate. Having finished the story of H.H. Mansbach and his family, I want to return to his two older siblings, Abraham and Henrietta. As I wrote earlier, Abraham and Henrietta married siblings: Eliza and Gabriel Gump. Abraham died on November 18, 1887, leaving Eliza with two children, Mollie, who was 21, and Jerome, who was nine. Then Henrietta died on March 15, 1893, survived by her husband Gabriel and their four sons, Abraham, Louis, Harry, and Joseph. What happened to these surviving spouses and their children? This post will be about Abraham Mansbach’s family, his wife Eliza, and children Mollie and Jerome. 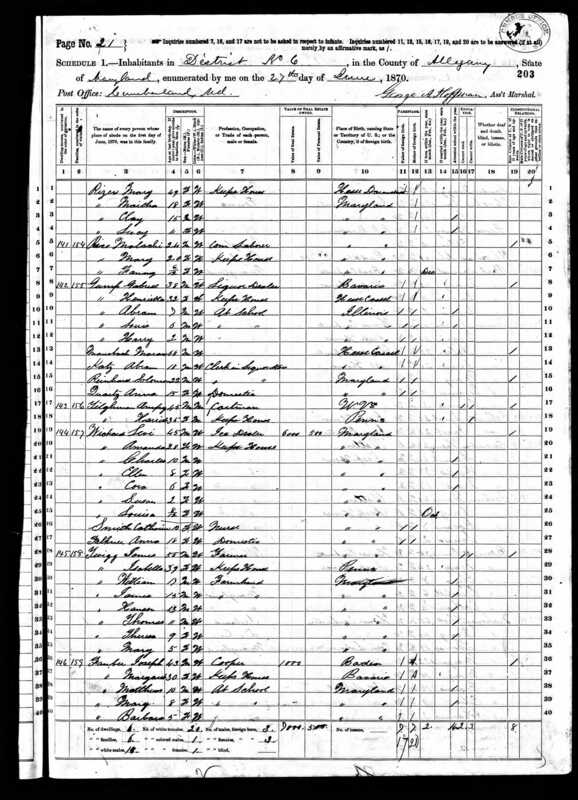 According to the 1900 census, Mollie Mansbach, Abraham and Eliza’s daughter, married Herman Kerngood in 1886 when she was twenty years old. Herman was born in Warburg, Germany, in 1859 and had immigrated to the US in the 1870s. By 1880 he was living in Baltimore with his uncle, William Kerngood, working as a clerk in his uncle’s dry goods business. But Herman did not remain a clerk for long. He established the Alma Button Company (later Alma Manufacturing) in 1887, the same year he married Mollie Mansbach. 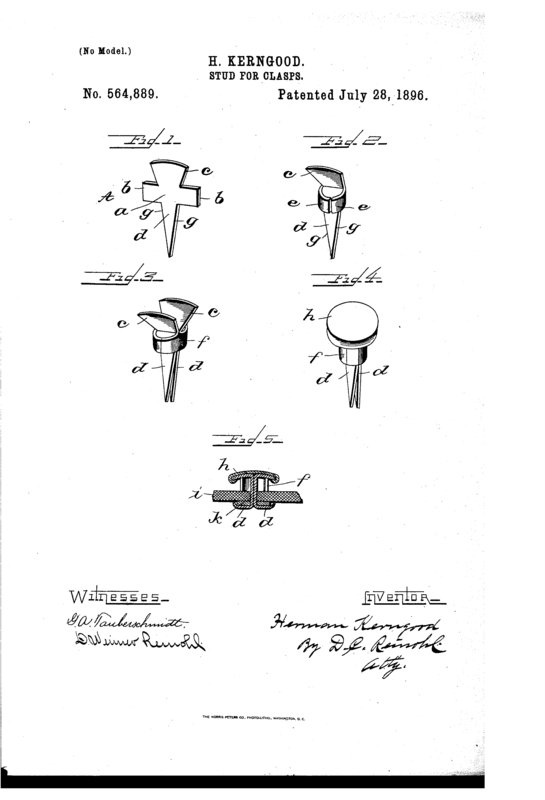 Founded in 1887 by 28-year-old German immigrant Herman Kerngood, the Alma Manufacturing Company manufactured a wide variety of metal clothing trimmings including buckles, clasps, fasteners and steel buttons. Before Kerngood started his operation, conveniently located alongside the Baltimore & Ohio railroad tracks, textile companies in the United States had imported all their steel buttons from Germany. The firm produced around 35,000 specialized products (the “Superior Pantaloon Button” and “Perfect Trousers’ Hook” to name just a few) and could be found attached to hats, umbrellas, shoes and, of course, clothing produced at factories around the country. At the beginning of the 20th century, Herman Kerngood formed a partnership with Moses Hecht, Benjamin F. Hecht, Nathan I. Hecht, S.B. Sonneborn, and Isaac Blum, to establish the American Steel Buckle Company, Inc. with an authorized capital stock of $1000. The Hechts were of the same family that started Hecht Brothers and the Hecht Company chain of department stores in the Baltimore-Washington region, starting with a used furniture store founded by Samuel Hecht, in 1857. 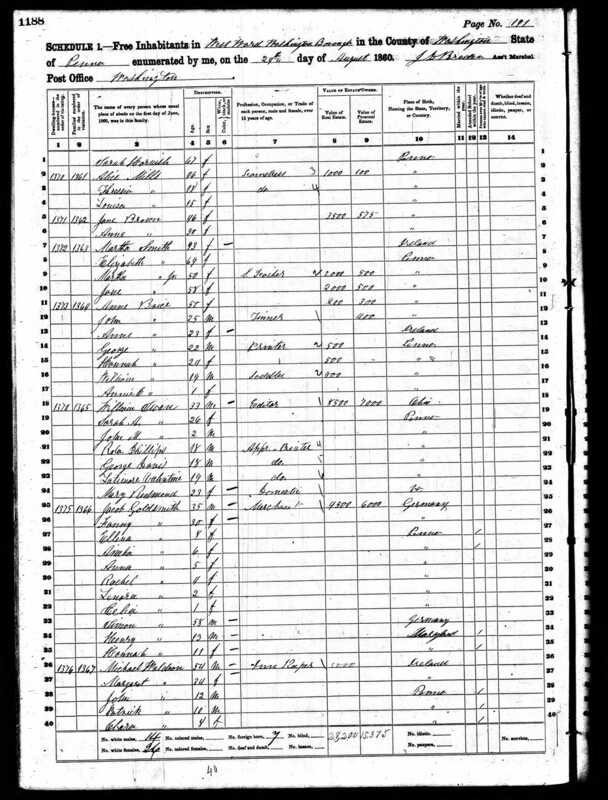 In 1900, Mollie and Herman Kerngood were living with their two sons, Allen (11) and Morton (10) as well as Mollie’s mother Eliza (who for some reason is identified as Herman’s aunt on the census report). On March 25, 1900, he was identified in the Philadelphia Inquirer as being from Baltimore and visiting his first cousin Bertie (Bertha) Mansbach in Cumberland, Maryland. Bertha was the daughter of H.H. Mansbach, Jerome’s uncle. This is more evidence that despite the fact that H.H. and his brother Abraham served on opposite sides of the Civil War, there was some continuing family relationship afterwards. So where was Jerome living at that time? I don’t know, but as noted above, he does reappear in the Baltimore city directory in 1906, living at the same address where his sister and her family and his mother were living in 1900, McCulloh Street. In 1907, he is listed as a clerk living at the Hotel Forbes in Baltimore. But he is not listed in the Baltimore directory after 1907 for several years until he reappears in the 1914 edition. Nor can I find him on the 1910 census. 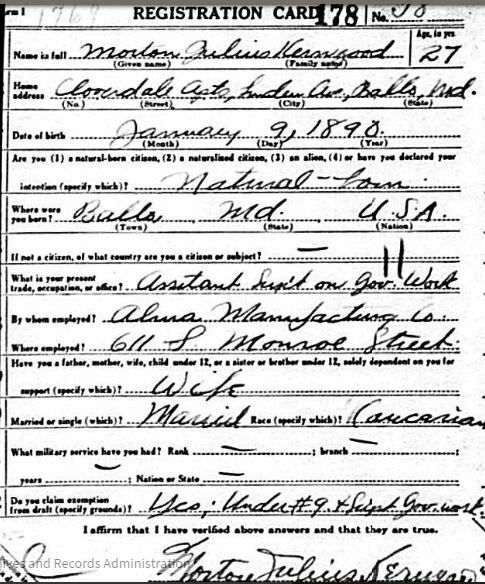 I also had no luck locating his mother Eliza (Gump) Mansbach on the 1910 census nor in any directory or other record for that year. The only members of the Abraham Mansbach family I could find on the 1910 census were Mollie (Mansbach) and Herman Kerngood and their two sons. Mollie and Herman were still living in Baltimore with their younger son Morton, who was now twenty. Both Herman and Morton were working in Alma Manufacturing, Morton as a salesman. Their older son Allen, 21, was living with his uncle, Julius Kerngood, in New York City and working as a “commercial traveller” selling buttons, presumably for his father’s company. Jerome Mansbach reappears in the 1914 Baltimore directory, listing himself as a commercial traveler, and has the same listing in 1915. I’ve no idea where Jerome was between 1907 and 1914, but my best guess is that as a traveling salesman, he was on the road so much that he somehow was missed in the 1910 census and wasn’t settled enough to list himself in a city directory for those years. But on July 15, 1915, Jerome did finally settle down. He married Ida Herzog, daughter of Charles and Josephine (Schwartz) Herzog of Govans, Maryland, a neighborhood in Baltimore. Ida’s father Charles was a Baltimore native, and her mother was born in New Jersey. Charles, the son of a beer brewer, was a lawyer, and Ida’s maternal grandfather, Andrew Schwartz, was a Methodist minister. I can’t help but wonder how Ida’s grandfather felt about her marrying the son of a Jewish immigrant. What really caught my eye in the marriage announcement, however, was the statement that Ida was the sister of “Buck” Herzog, “manager of the Cincinnati team.” I’d never heard of him before, but being a big baseball fan, I was curious as to whether the “Cincinnati team” meant the Cincinnati Reds. 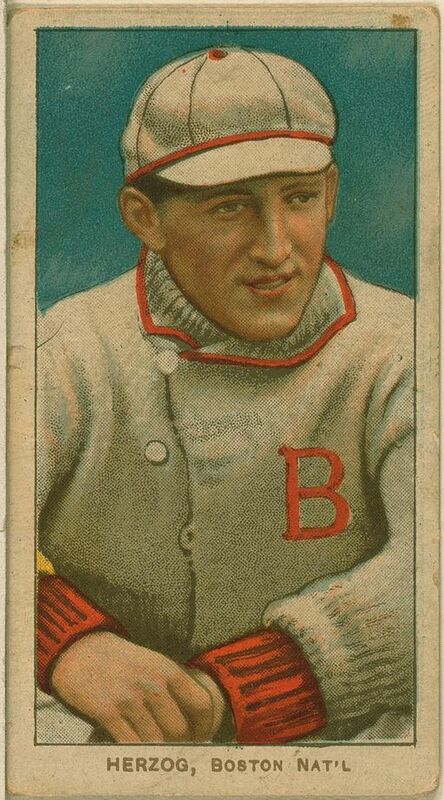 Sure enough, it did, and it turns out that Buck Herzog was not only a manager, but a former Major League player who had played in the 1912 World Series and broken the record for most hits in a World Series, a record that stood for over fifty years. 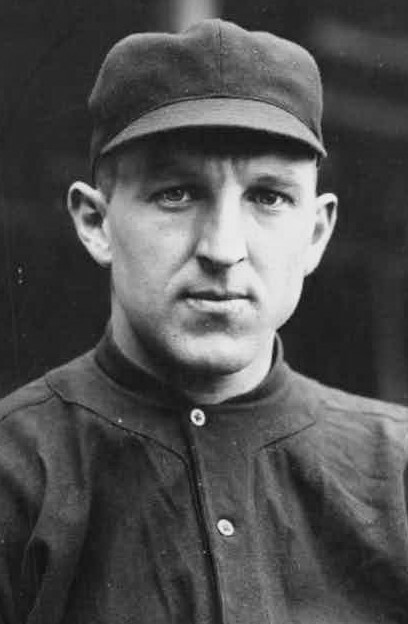 I realize that the connection is quite attenuated, but I still got a kick out of the fact that a distant cousin of mine married the sister of a genuine American baseball legend! 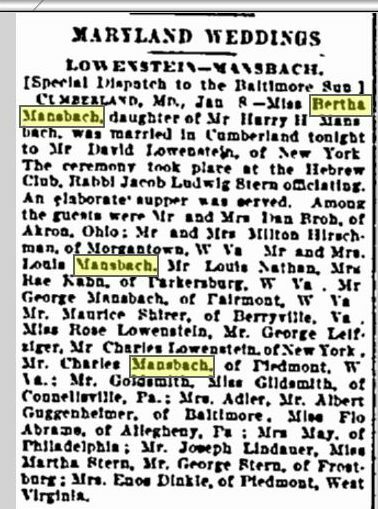 On January 8, 1902, the third daughter Bertha Mansbach married David Loewenstein of New York. David was a German immigrant who was in the clothing business. From the wedding announcement I am inferring that he had a brother Charles and sister Rose, but I’ve not been able to find out much else about him or his family. David and Bertha were married in Cumberland followed by an “elaborate supper.” According to the wedding announcement in the January 9, 1902, Baltimore Sun (p.10), at that time Bertha’s sister Fannie and her husband Daniel Broh were living in Akron, Ohio. The wedding announcement also indicated that Bertha’s sister Hattie and her husband Milton Hirschman were still living in Morgantown, West Virginia, in January, 1902. Missing from this list of guests was Isaac Mansbach, Bertha’s younger brother. By 1902, Isaac Mansbach had joined his parents and sister May in Cumberland, Maryland, where he was practicing law, according to the 1902 Cumberland directory. Why wasn’t he listed at his sister’s wedding? More on that below. 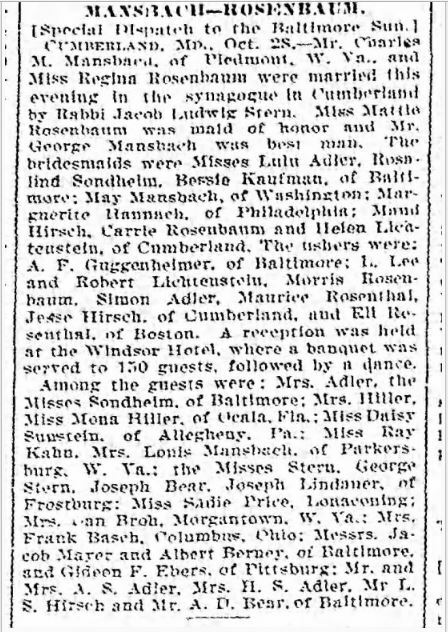 In October, 1903, Charles Milton Mansbach married Regina Rosenbaum in Cumberland. Once again, it appears to have been quite an elaborate occasion. In 1905 Charles was working as a bookkeeper in the Hirsch family business (his mother’s family) in Cumberland. 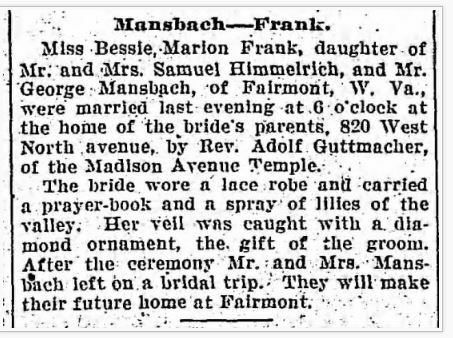 In October 1905, George Mansbach married Bessie Frank of Baltimore, Maryland; they settled in Fairmont, West Virginia. That made six weddings for the Mansbach siblings between 1893 and 1905, three of them in the last four years. Only Isaac and May had not yet married. In 1907 Fannie (Mansbach) and Daniel Broh were living in Fairmont, West Virginia; according to the 1907 Fairmont directory, Daniel was in the shoe business. 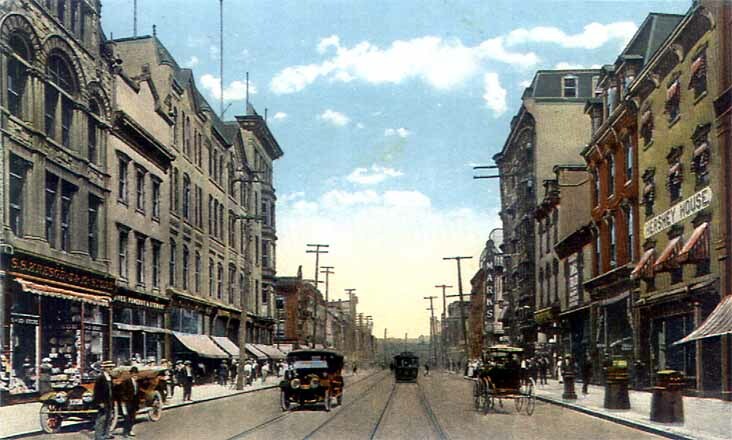 George and Bessie were also living in Fairmont, though George was still in business with his brother Louis; perhaps he ran the family store in Fairmont. Thus, in 1907, two of the eight Mansbach children were still in West Virginia. Two other siblings had moved to Norfolk, Virginia by 1907. Louis and his wife Clara were in Norfolk in 1907 as were Charles and his wife Regina. Charles and Louis owned a clothing store in Norfolk called The Hub that was in business for many years. Meanwhile, H.H. and Nannie continued to live in Cumberland, Maryland, with their youngest child, May, in 1907. Mrs. Nannie Mansbach, wife of Mr. H.H. Mansbach, died suddenly this morning at 6 o’clock at the Mansbach residence, No. 8 Park street. Mrs. Mansbach was slightly indisposed some two weeks ago, but had recovered and was feeling in her usual good health when she retired last evening. This morning at 5:30 o’clock Mrs. Mansbach aroused her husband, saying that she was suffering considerable misery. A physician was hastily summoned, but to no avail, as Mrs. Mansbach passed away a few minutes later. Death was due to heart failure. Mrs. Mansbach was 60 years of age and was a Miss Hirsch prior to her marriage. Mrs. Mansbach’s death came as a great blow to her husband, who is almost prostrate from the shock. The deceased was one of the best known women in Cumberland. She was of an amiable and charitable disposition, and her sudden death caused a shock to pervade the entire community and surrounding territory, as she had as unusually large acquaintance. The greatest portion of her life was spent in this city [Cumberland], although some years were spent in Wheeling and Piedmont, while her husband who is a tailor, was engaged in business in those places. Besides her husband she is survived by the following children: Messrs. Louis and Charles Mansbach, Norfolk, Va.; Mrs. Milton Hirschman, Morgantown; Mrs. Fannie Brode [sic[, and George Mansbach, Fairmont, W.Va.; Mrs. David Lowenstein [sic], New York city, and Miss May Mansbach, who resides at home. …. What a terrible loss this must have been for H.H. and all of the Mansbach children. I found a few things of particular interest in the obituary. First, the article describes H.H. as a tailor—in the present tense. Although H.H. may have started out as a tailor, by 1907 he was well-known as a very successful merchant, as the 1893 Piedmont Dispatch profile of him had reported. Second, the obituary revealed that Bertha and David Loewenstein were living in New York City, that Hattie and Milton Hirschman were living in Morgantown, West Virginia, and also confirmed the residence location of five of the six other children. But one child is missing from the list of survivors—Isaac, the Mansbach’s youngest son who had become a lawyer. He also had not been listed as a guest at his sister Bertha’s wedding. Why would he not have been included? The one record I could find for Isaac between the date of the 1900 census and his mother’s death was the listing of him as a lawyer in the 1902 Cumberland directory. Where had he gone from there? 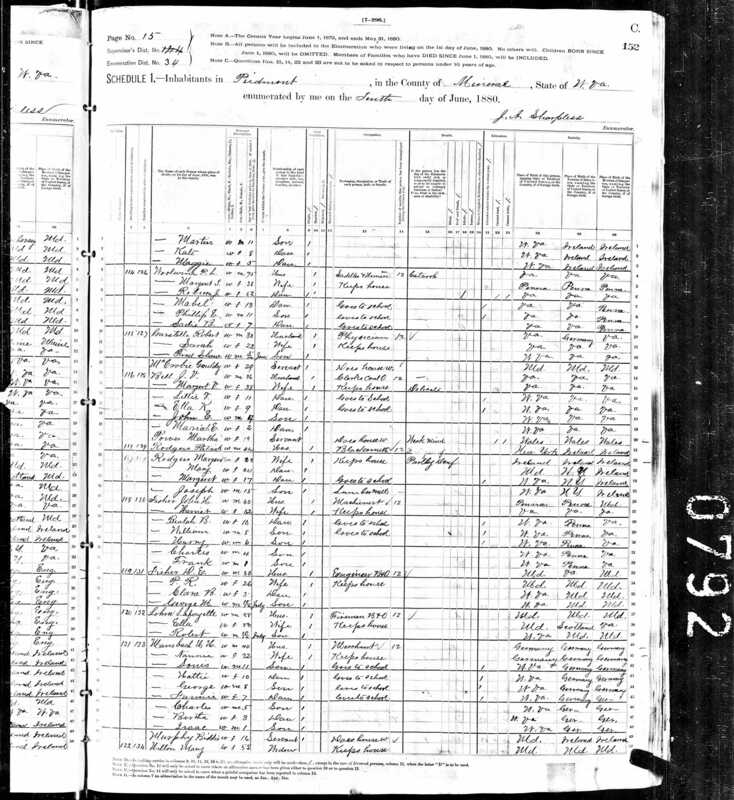 The 1910 census provided updates on most of the family. Four of the eight Mansbach siblings were now in Norfolk, Virginia. Louis and his wife Clara were living in Norfolk in a lodging house of some sort; Louis was still in the dry goods business with his brother Charles. Charles and his wife Regina and their four year old daughter Helene were also living in Norfolk. Fannie and her husband Daniel Broh and daughter Doris had now moved from West Virginia to Norfolk; Daniel listed his occupation as the proprietor of a dry goods business. I don’t know whether he was in business with his brothers-in-law, Louis and Charles, or in his own store. The family patriarch, H.H. Mansbach, and his youngest child, May, who was now 23, were also living in Norfolk in 1910; although I could not locate them on the 1910 census, they were listed as living at 140 Main Street in Norfolk in the 1910 city directory. That is the same address given for Fannie and Daniel Broh on the 1910 census yet H.H. and May were not listed in their household. The other children were more dispersed. Hattie and her husband Milton Hirschman and their children were living in New York City where Milton was a real estate broker in 1910. Bertha (Birdie) and her husband David Loewenstein and their son were also living in New York City where David was working as an underwear salesman. George Mansbach was harder to find as for some reason he is listed as George W. Harris on the 1910 census, living in Providence, Rhode Island, working as a clothing merchant. I only concluded this was the right George based on his birth place in the census (West Virginia), his parents’ birthplaces (Germany), his age and occupation, and because I found George W. Mansbach listed in the Providence, Rhode Island, directories for several years starting in 1911. That left only Isaac, the son who was missing from the list of those attending his sister’s Bertha’s wedding in 1902 and from the list of surviving children on his mother’s obituary in 1907. 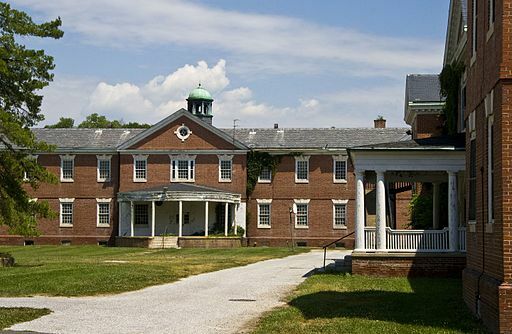 I learned of his whereabouts from the 1910 census; Isaac was a patient at the Springfield State Hospital, a psychiatric hospital in Sykesville, Maryland. From later census reports through 1940, it appears that he remained there for the rest of his life. Since Louis and Clara had been living in Norfolk at the time of the 1910 census just months before, I was surprised to see this as her place of death. 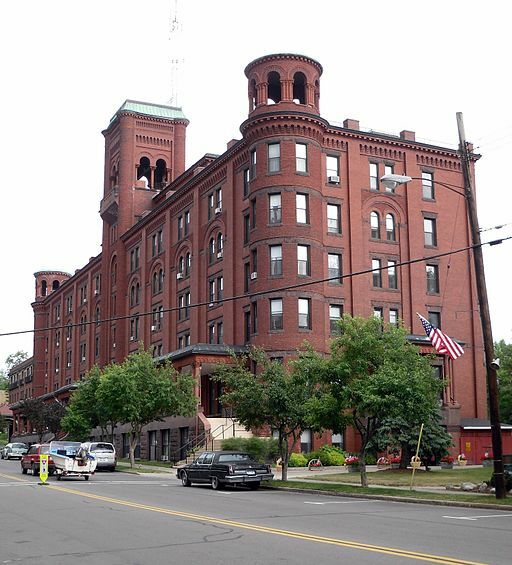 But research revealed that Clifton Springs was the location of a well-known “water cure” sanitarium. Clifton Springs was once known as Sulfur Springs and had become a place where people came to recover their health. Although I don’t know what ailment Clara suffered from, she apparently had been ill for some time. Perhaps she had never really recovered from the loss of her baby daughter Frances in 1899. Thus, the years 1900 to 1910 brought more weddings and children to the family, but also some losses and difficult challenges. What would the next decade bring for H.H. Mansbach and his family? More on that in my next post. After the Civil War: Did the Mansbach Family Come Together? As we saw in my last post, two of the nephews of my great-great-grandfather Gerson Katzenstein fought on opposite sides of the Civil War. Abraham Mansbach served (albeit briefly) in the Union army whereas his younger brother Heinemann, aka Henry or Harry or H.H. Mansbach, fought for the Confederacy. I thought it would be worthwhile to research their post-Civil War lives to see if I could learn what effect, if any, this had on their relationship. After being injured twice fighting in the Confederate army, H.H. Mansbach settled in Piedmont, West Virginia, where he became a dry goods merchant. By 1868, H.H. had married Nannie Hirsch, who was born in Germany and whose parents had settled in Cumberland, Maryland, which is about 25 miles from Piedmont, West Virginia. In 1870, Nannie’s parents were still living in Cumberland, Maryland, where her father was a merchant. As of 1870, H.H. and Nannie had two children, Louis, born in 1868, and Hattie, born in 1869. 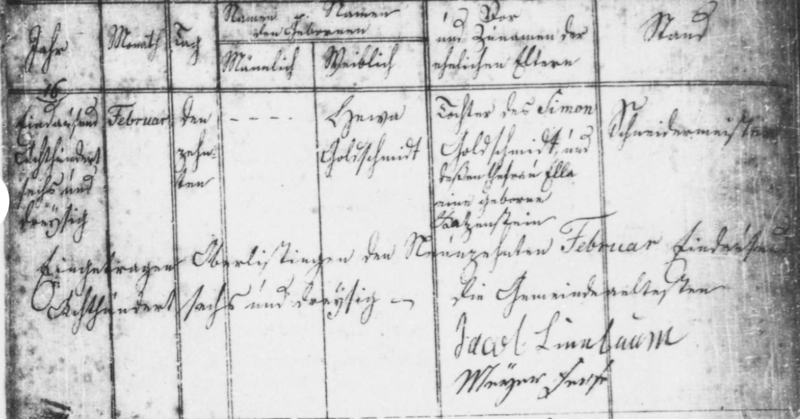 Where was the rest of the Mansbach family during this time period? H.H.’s sister Henrietta was, by 1861, living in the United States and married to Gabriel Gump, who was also a German immigrant. By July 1862, they had settled in Morris, Illinois, where their first child Abraham was born. In June 1863 with the Civil War going on, Gabriel, a saloon keeper, registered for the draft in Illinois, so he was on the Union side of the war, opposing Henrietta’s brother H.H. By 1870, Gabriel and Henrietta had moved to Cumberland, Maryland; they had three children at that time, Abraham (7), Louis (6), and Harry (2), all born in Illinois. Also living with them by that time was Henrietta’s father, Marum Mansbach, who had emigrated from Germany on August 6, 1864. Thus, in 1870, H.H. Mansbach’s sister Henrietta and father Marum were living in Cumberland, Maryland, the same town where H.H.’s in-laws were living and where his wife Nannie had lived herself before marrying H.H. in 1868. I find it hard to believe that this was just coincidence and thus take it as a sign that H.H. still had a relationship with his family despite the fact that he’d fought for the Confederacy while his brother Abraham and his brother-in-law Gabriel had been on the side of the Union. As for Abraham Mansbach, brother of H.H. and Henrietta, he had married Eliza Gump in Philadelphia on January 6, 1861. Eliza was the younger sister of Gabriel Gump, husband of Abraham’s sister Henrietta. Abraham and Eliza had a daughter Mollie, born in October 1866. I was unable to locate them on the 1870 census, but in 1873, they were living in Baltimore where Abraham was engaged in the wholesale liquor business. Thus, in some way the Hirsch-Mansbach-Gump families were all interconnected by marriage and/or geography. Henrietta (Mansbach) and Gabriel Gump were living in the same town as HH Mansbach’s in-laws in 1870. Abraham Mansbach was married to Gabriel Gump’s sister. Perhaps they all knew each other from the “old country” or perhaps they’d all just met after immigrating to the US. But it certainly seems that at a minimum, H.H. had not been banished from the family since he somehow ended up marrying the daughter of his sister’s neighbors in Cumberland. Between 1870 and 1880, the families of the Mansbach siblings grew. H.H. and Nannie had five more children in that decade: George (1871), Fannie (1873), Charles (1875), Bertha (1876), and Isaac (1879). Thus, by 1880, there were seven children in the family; they were still living in Piedmont, West Virginia, where Harry continued to work as a merchant. By 1880, Henrietta and Gabriel Gump were no longer living in Cumberland, Maryland. They had moved to Baltimore where Gabriel was now in the liquor business with his brother-in-law Abraham Mansbach. Henrietta and Gabriel now had four sons: Abraham (17), Louis (16), Harry (12), and Joseph (9). Marum Mansbach was still living with them as well. 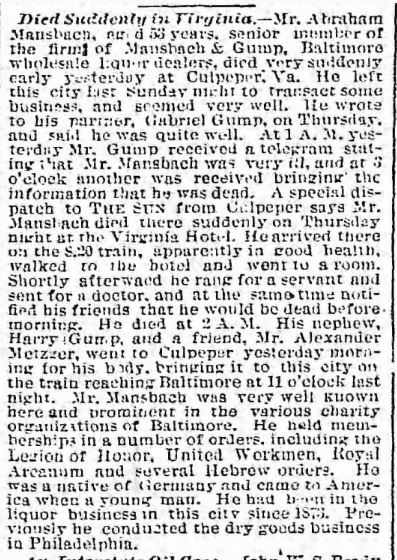 Abraham Mansbach, brother of Henrietta and H.H., was still living in Baltimore in 1880, working in the liquor business with Gabriel, as stated above. Abraham and his wife Eliza (Gump) now had two children: Mollie (fourteen) and Jerome (six months). Death of a well-known old German man. 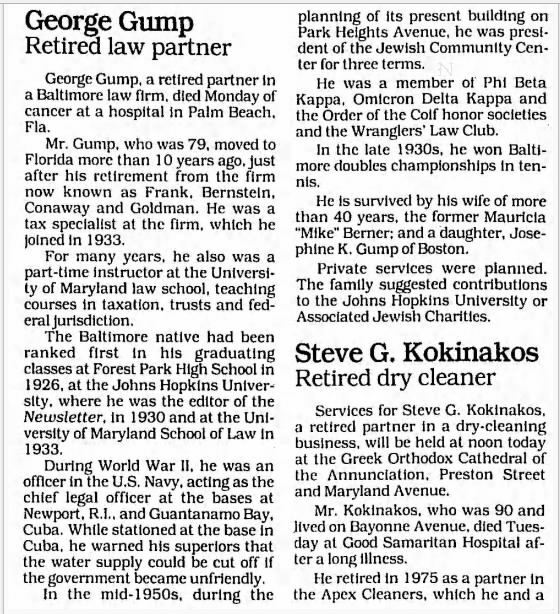 One of the oldest Jewish men in Baltimore, Marum Mansbach, died of throat cancer in his 83rd year, on Monday evening at the house of his son-in-law G. Gump, 26 South Green St/Rd. Mr Mansbach was born in Maden, Electorate of Hessen, and came to Philadelphia in 1865. From Philadelphia he moved to Cumberland, Md, and then ten years ago he moved here with his son-in-law. His wife died 43 years ago, leaving him three children who are still alive, sons A. and H. Mansback and Mrs Henriette Gump. The elder of the sons runs a Whiskey wholesalers with his brother-in-law Mr Gump, and the younger has settled in Wheeling, W.-V. The funeral will take place this morning at 10 am at the cemetery of the Hanover St/Rd Synagogue. Abraham Mansbach was survived by his wife, Eliza, his daughter, Mollie, age 21, and his son Jerome, who was nine years old. Then six years after Abraham’s death, his sister Henrietta died on March 15, 1893. She was sixty-one years old and was survived by her husband Gabriel Gump and their four adult sons, Abraham, Louis, Harry and Joseph. 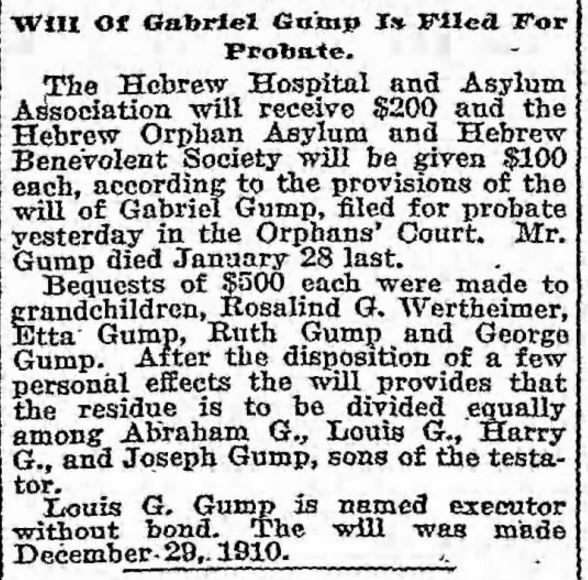 Gabriel Gump and his sister Eliza Gump Mansbach were thus both widowed by 1893, and H.H. Mansbach had lost his father, his brother, and his sister in the ten year period starting in 1883. Although it is hard to know exactly what relationship H.H. had with his family of origin by then, it nevertheless must have been sad for him to lose them all within such a short period of time. More on what happened to the families of Henrietta, Abraham, and HH in the 20th century in posts to follow. Sailing with Marum were two young women: Bertha, age 24, and Elise, age 17. I’ve not yet determined who they were and what relationship they might have had to Marum. Some families seem to suffer more misfortune than others. This is one of those families. It is the story of the family of Mathilde Dreyfuss, sister of my three-times great-grandmother Jeanette, and her family. Her first husband was John Nusbaum’s brother Maxwell Nusbaum, making this particular line related to me both on my Dreyfuss side and my Nusbaum side. That is, Mathilde and Maxwell’s children are my double first cousins, four times removed. As I have written, Maxwell Nusbaum and Mathilde Dreyfuss had two children, a daughter Flora born in 1848 and a son Albert born in 1851. Less than seven months after Albert’s birth, Maxwell died in the 1851 Great Fire in San Francisco. By 1856 Mathilde had married Moses Pollock, with whom she had three more children, Emanuel, Miriam, and Rosia. The family lived in Harrisburg for many years, but by 1866 had relocated to Philadelphia. In the 1870s, the Pollocks were living in Philadelphia where Moses was a dry goods merchant. Their youngest child Rosia died in 1871 when she was just five months old. 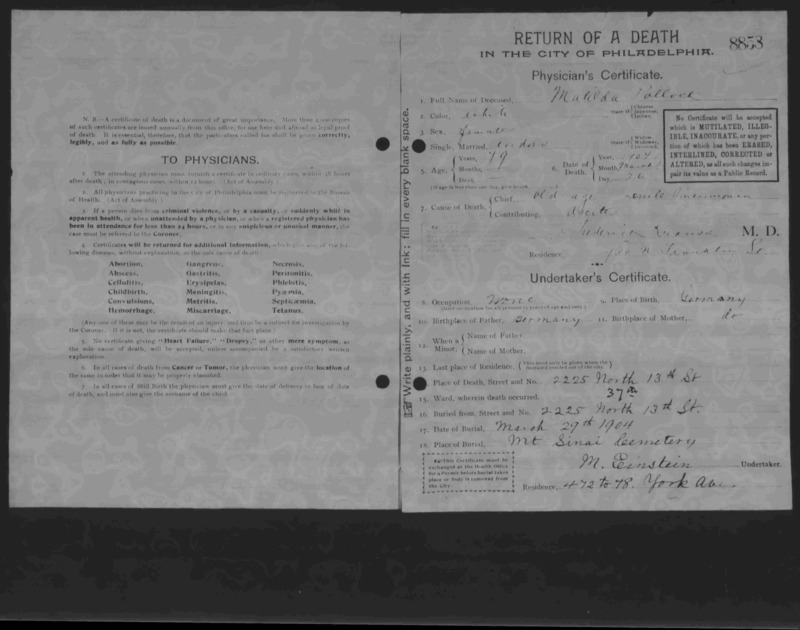 Pennsylvania, Philadelphia City Death Certificates, 1803-1915,” index and images, FamilySearch (https://familysearch.org/pal:/MM9.1.1/JK3P-DBS : accessed 22 January 2015), Rosie Pollock, 26 Feb 1871; citing 1075, Philadelphia City Archives and Historical Society of Pennsylvania, Philadelphia; FHL microfilm 2,020,735. Mathilde’s daughter Flora had married Samuel Simon, one of the three brothers to marry into the Nusbaum/Dreyfuss clan, and they had two children in the 1870s, Meyer (mostly likely named for his grandfather Maxwell) and Minnie. 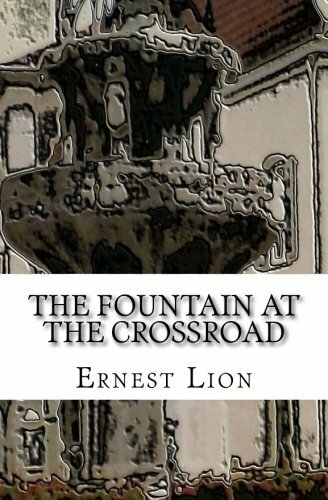 By 1880, Flora and Samuel had moved to Elkton, Maryland, where Samuel was running a hotel. 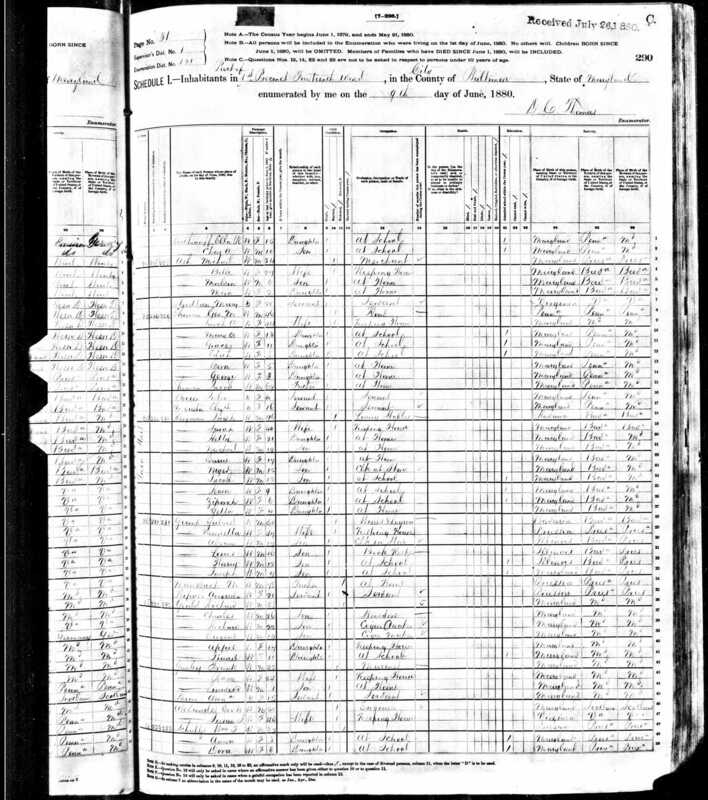 Meanwhile, Moses and Mathilde (Dreyfuss Nusbaum) Pollock were still in Philadelphia, and the other surviving children—Albert Nusbaum and Emanuel and Miriam Pollock—were still living at home with them, according to the 1880 census. Moses was in the cloak business, Albert was in the liquor trade, and Emanuel was in the dry goods business. Moses’ line of trade seemed to change to trimmings or finishings during the 1880s and 1890s with various directories listing his businesses as plaiting, laces, embroidery, school bags, and accordion pleating. Mathilde’s family was struck by tragedy again on September 1, 1885, when Miriam Pollock, just 26 years old, died from consumption or tuberculosis. Mathilde had lost her first husband to a fire, her daughter Rosia at five months, and then her daughter Miriam at 26. Sometimes life is just not fair. 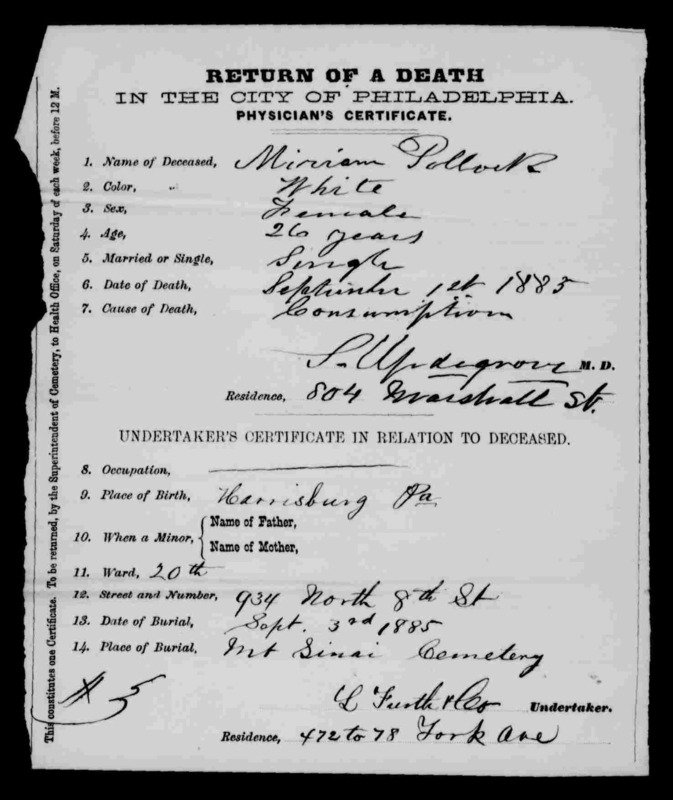 “Pennsylvania, Philadelphia City Death Certificates, 1803-1915,” index and images, FamilySearch (https://familysearch.org/pal:/MM9.1.1/JFSV-LHQ : accessed 22 January 2015), Miriam Pollock, 01 Sep 1885; citing , Philadelphia City Archives and Historical Society of Pennsylvania, Philadelphia; FHL microfilm 2,070,682. Then Moses Pollock died on December 5, 1894 of encephalomalacia, defined in Wikipedia as “localized softening of the brain substance, due to hemorrhage or inflammation.” Like so many other family members, he was buried at Mt. Sinai cemetery in Philadelphia. He was 69 years old. 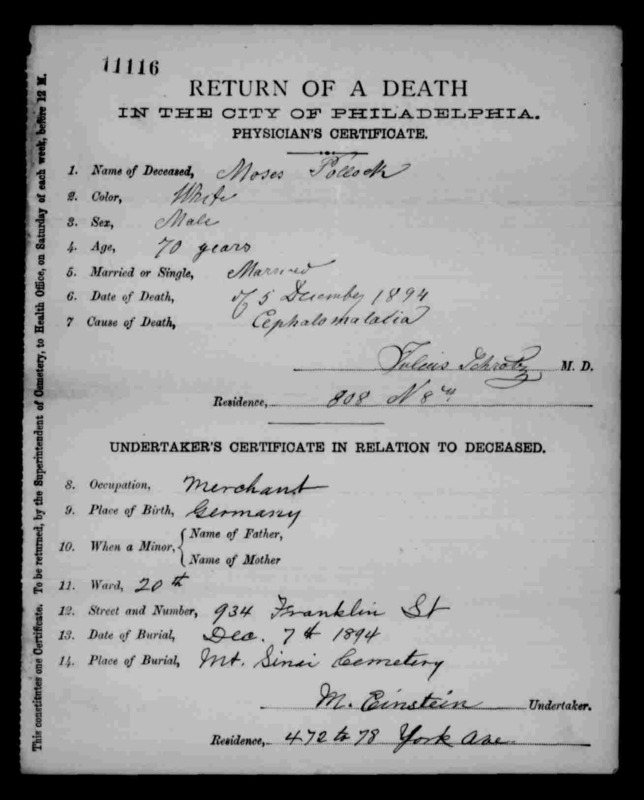 “Pennsylvania, Philadelphia City Death Certificates, 1803-1915,” index and images, FamilySearch (https://familysearch.org/pal:/MM9.1.1/JKS4-32N : accessed 22 January 2015), Moses Pollock, 05 Dec 1894; citing cn 11116, Philadelphia City Archives and Historical Society of Pennsylvania, Philadelphia; FHL microfilm 1,872,200. Both Albert Nusbaum and Emanuel Pollock had continued to live with their parents throughout the 1880s and 1890s, and in 1900, they and their mother were still living together at the same address, 934 North Eighth Street. Mathilde, now widowed twice in addition to losing two children, was working outside the house as a manufacturer of bags—presumably, the school bags listed as one of the items Moses was selling on the last directory entry before his death. Albert was still a liquor salesman, and Emanuel was selling bicycles. In addition, Meyer Simon, Flora’s son and Mathilde’s grandson, now 30 years old, was also living with them and was working with his grandmother in the bag manufacturing business as a manager. Mathilde’s daughter Flora Nusbaum and her husband Samuel Simon, meanwhile, had left Elkton, Maryland, and moved to Baltimore by 1885. Samuel was in the liquor business, as was his brother Moses, who was married to Paulina Dinkelspiel, Flora’s first cousin. My hunch is that they were business together. In 1900, Samuel was still in the liquor business in Baltimore, but his brother Moses had died the year before. Samuel and Flora still had their daughter Minnie living at home with them, but their son Meyer, as noted above, was living in Philadelphia with his grandmother and uncles Albert and Emanuel and managing the bag manufacturing business. Although Meyer Simon was listed as single on the 1900 census, the 1910 census reported him as married for 12 years. I figured that this must have been a mistake, especially since he was still living at his grandmother’s address even in the 1901 directory. It seemed he could not have been married for 12 years in 1910. But then I found something strange. After some further research and review, I found in the Pennsylvania, Marriages 1709-1940 data base on familysearch.org a marriage between Meyer Simon and Tillie Perry on September 18, 1897, in Allegheny, Pennsylvania. 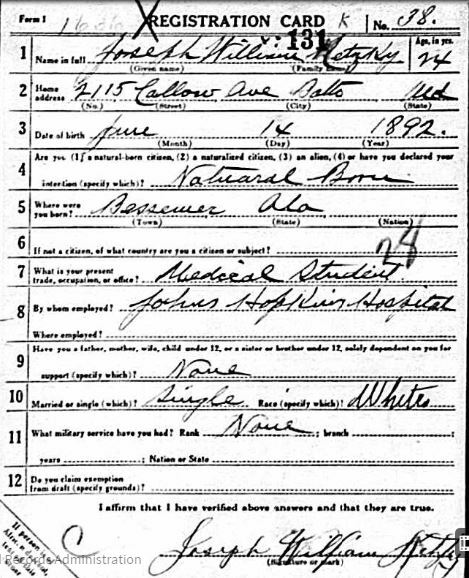 Meyer’s wife’s name on the 1910 census was Matilda, so I knew this was the correct marriage. Matilda or Tillie Perry was the daughter of William and Matilda Perry; she was born in Philadelphia in 1876 and baptized in the Episcopal church in 1878. 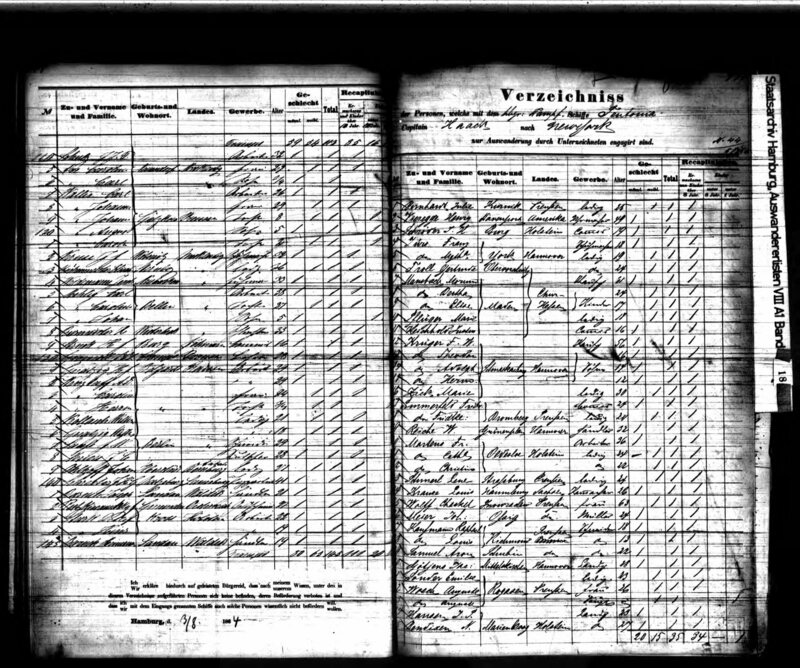 But if Meyer and Matilda were married in 1897, why was Meyer listed as single on the 1900 census, and where was Matilda? 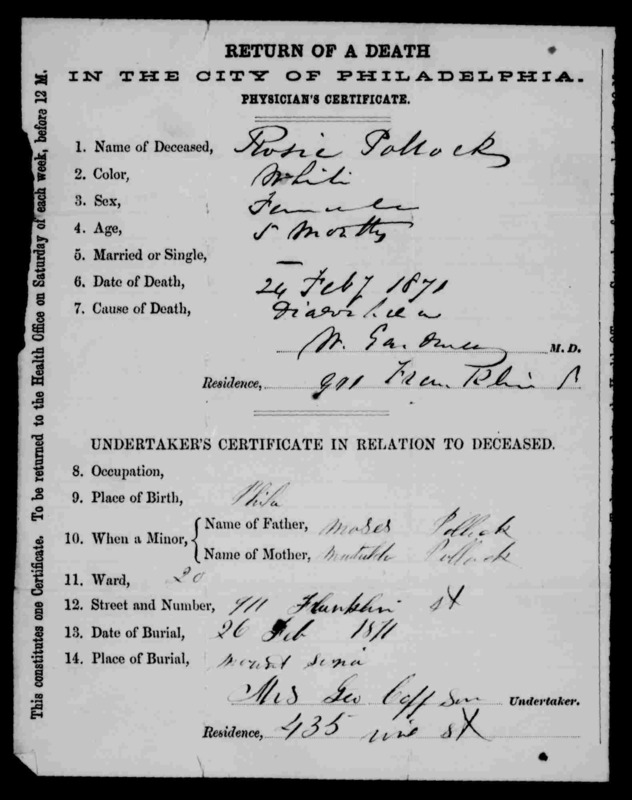 I found Matilda Perry on the 1900 census living with her parents in Philadelphia, and that census report stated that she was married and had been married for three years, which is consistent with the marriage record I found on familysearch. Had Meyer and Matilda married and then lived separately for at least three years? It seems strange, but perhaps they could not yet afford a place of their own. Or perhaps they were temporarily separated. Or perhaps the religious differences had made it difficult for those families to support the marriage. After all, Meyer listed his marital status as single. I suppose it is also possible that he had kept the marriage a secret from his family. After all, they were married in Allegheny, not in Philadelphia or in Baltimore where their families lived. Allegheny was a city across the river from Pittsburgh that merged with Pittsburgh in 1907. It would have been therefore over 300 miles from Philadelphia and about 250 miles from Baltimore. Thus, as of 1900, Mathilde Dreyfuss Nusbaum Pollock was a widow, living in Philadelphia with her two sons, Albert and Emanuel. Her daughter Flora was living with her husband Samuel Simon in Baltimore with their daughter Minnie, and their son Meyer was married, but not yet living with his wife Matilda. The decade that followed must have been a very painful one. First, on March 21, 1904, Mathilde Pollock died. She was 79 years old. The death certificate says she died of old age, which shows you how perspectives on aging and longevity have changed. It also says that she died from “senile pneumonia,” a term for which I could find no easily understood definition for my non-medical brain to grasp, but which I gather is a form of pneumonia that affects the elderly. (Feel free to provide a more scientifically accurate definition.) The death certificate also says that Mathilde had ascites, another term not easily defined but which Wikipedia defines as “gastroenterological term for an accumulation of fluid in the peritoneal cavity.” Don’t even get me started on trying to understand where the peritoneal cavity is, but from what I read, ascites seems to have something to do with liver disease, often cirrhosis. Mathilde’s death was followed three years later by the death of her son Emanuel Pollock on February 16, 1907. He was only fifty years old and died of tuberculosis. Three years after that his half-brother Albert Nusbaum died on August 28, 1910 from apoplexy brought on by arteriosclerosis. He was 59 years old. Mathilde and both of her sons were buried at Mt. Sinai cemetery. That left only Flora Nusbaum Simon as the surviving child of Mathilde Dreyfuss Nusbaum Pollock. She had lost both of her parents and all four of her siblings. She was also the only child who had children of her own as none of her siblings ever married or had children. Flora and Samuel appear to have relocated from Baltimore to Philadelphia by 1905, the year after her mother died, as Samuel appears in the Philadelphia directory living at 2225 North 13th Street, the same address where the family is listed in the 1910 and 1920 census reports. Flora’s brother Albert had been living with them at that address in April when the 1910 census was taken, just four months before he died. Neither Samuel nor Albert nor anyone else in the household was employed at that time, yet they still had a servant living in the home. Minnie, Flora and Samuel’s daughter, was 27 and single, living with her parents and uncle. It feels like it must have been a very sad time for the family. Flora and Samuel’s son Meyer and his wife Matilda were living about two miles away at 2200 Susquehanna Avenue in 1910. Meyer was a clothing salesman. There were two boarders living with them, but no children. When Meyer registered for the World War I draft in 1917, he and Matilda were living at 3904 North Marshall Street, two and a half miles north of his parents and his sister. Meyer was employed as a clothing salesman for Harry C. Kahn and Son, according to his draft registration. 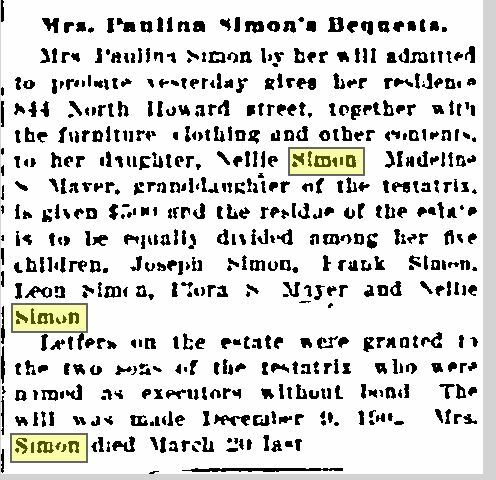 On February 18, 1919, Flora Nusbaum Simon suffered yet another loss when her husband Samuel Simon died from a cerebral hemorrhage at age 79. She and her daughter Minnie were living together in 1920 at their home at 2225 North 13th Street. Flora herself died almost four years to the day after her husband Samuel on February 20, 1923. She was 74 years old and died from chronic interstitial nephritis. She had outlived all of her siblings by over 13 years. She, like all the rest of them, was buried at Mt. Sinai cemetery with her husband Samuel. After her mother Flora died, Minnie Simon lived with her brother Meyer and his wife Matilda in the house on North 13th Street where Flora had died, number 2336, across the street from where they had lived for many years at 2225. Meyer was employed as a clothing salesman, and his niece Matilda (a fifth Matilda in his life) was also living with them. Meyer lost his sister Minnie six years later when she died from liver cancer on December 14, 1936; she was 63 years old. Meyer was the only member of his family left. He had no siblings, no nieces or nephews on his side. It must have been just too much for him when his wife Matilda then died on April 27, 1940, at age 63 from cerebral thrombosis and chronic nephritis. Two years later on June 2, 1942, Meyer took his own life. He was found on the second floor of his home at 2336 North 13th Street with a gunshot wound to his head. He had no survivors. Although Meyer was buried with his family at Mt. Sinai, he was not buried with his wife Matilda. She was buried at a non-denominational cemetery instead (Northwood); because she was not Jewish, she could not be buried at Mt. Sinai. How sad. This story fills me with such sadness. How lonely Meyer must have been. He’d lost his grandparents, his parents, his aunts and uncles, his sister, and his wife. And there were no children or nieces or nephews left to comfort him. Certainly there were other Nusbaum cousins nearby in Philadelphia, but it must not have been enough. From the start of the story of the life of Meyer’s grandmother Mathilde Dreyfuss, this family suffered such tragedy: Maxwell’s death in the Great Fire of San Francisco and two daughters who died young. Of Mathilde’s four children who grew to adulthood, only Flora married and had children, and there were no grandchildren to carry on the family line after Flora and Samuel Simon and their two children Meyer and Minnie died. There are no living descendants of Mathilde Dreyfuss or Maxwell Nusbaum. No one likely remembers their names. Except now they have been found and can be remembered for the tough lives they lived and for the courage and hope they must have had when they arrived in Pennsylvania in the middle of the 1800s. Isaac died without any children in 1870, so unfortunately that was the end of that sibling’s line. Flora’s father Maxwell Nusbaum was the brother of Paulina Dinkelspiel’s mother, Mathilde Nusbaum Dinkelspiel. Poor Meyer had at least four Mathilde/Matildas in his life: his mother, his wife, his mother-in-law, and one of his aunts. And today I don’t know one woman named Mathilde or Matilda or Tillie. My three-times-great-grandfather John Nusbaum had one sister who settled in the US (or at least she is the only one I’ve found): Mathilde Nusbaum, who married Isaac Dinkelspiel in Germany and immigrated with him to Harrisburg, Pennsylvania. As I have already discussed, Mathilde died in 1878, and her husband Isaac Dinkelspiel died in 1889. Their son Adolph died in 1896, and he had no children who survived him. That left Mathilde and Isaac’s two daughters, Paulina and Sophia, to continue the family line, although not the Dinkelspiel name. 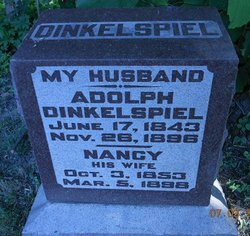 Sadly, Adolph Dinkelspiel was the last member of my family to have this rather unique and interesting name. This post will focus on the family of Paulina Dinkelspiel. Paulina had married one of the three Simon brothers, Moses, and in 1880 they were living in Baltimore with their children: Joseph, Francis, Leon, Flora, and Nellie, ranging in age from eighteen down to eight years old. Moses was in the retail liquor business. Moses remained in the liquor business throughout the 1880s and 1890s until he died on February 12, 1899, at age 64. 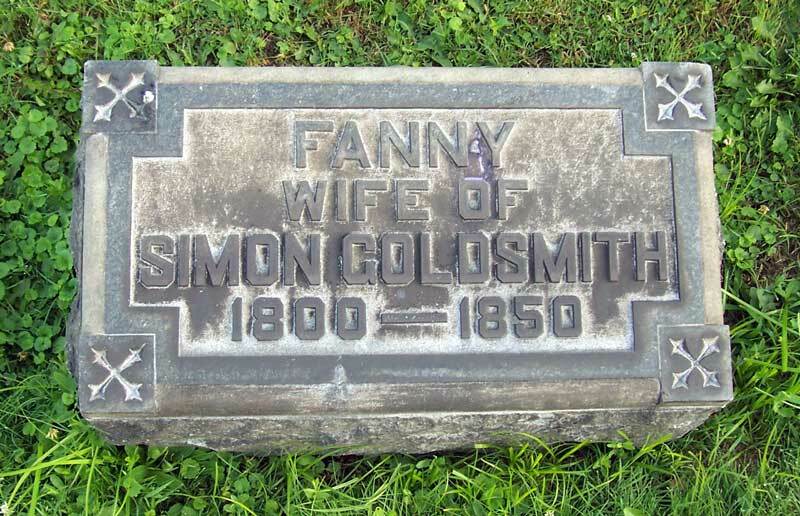 His wife Paulina Dinkelspiel Simon died five years later on March 29, 1904. She was 63. The terms of Paulina Dinkelspiel Simon’s will were disclosed in a news story in the April 16, 1904, edition of the Baltimore Sun, page 8. She left her house and its contents to her daughter Nellie. Her granddaughter Madeline Mayer (daughter of Flora Simon Mayer, to be discussed in my next post) was given $500, and the rest of the estate was divided evenly among her five surviving children, Joseph, Francis, Leon, Flora, and Nellie. It is interesting that she singled out one child and one grandchild over the others. Paulina was buried at Oheb Shalom cemetery in Baltimore along with her husband Moses, her parents Isaac and Mathilde (Nusbaum) Dinkelspiel, and the two children who predeceased her and Moses, Albert and Miriam. Paulina and Moses Simon’s oldest child Joseph Simon had married Emilie Baernstein in July, 1889, in Baltimore, where she was born and raised. 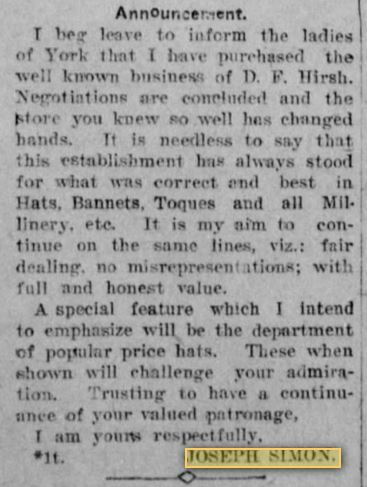 By 1902, Joseph and Emilie had moved to York, Pennsylvania, where Joseph purchased a millinery shop. York Daily, January 13, 1902. 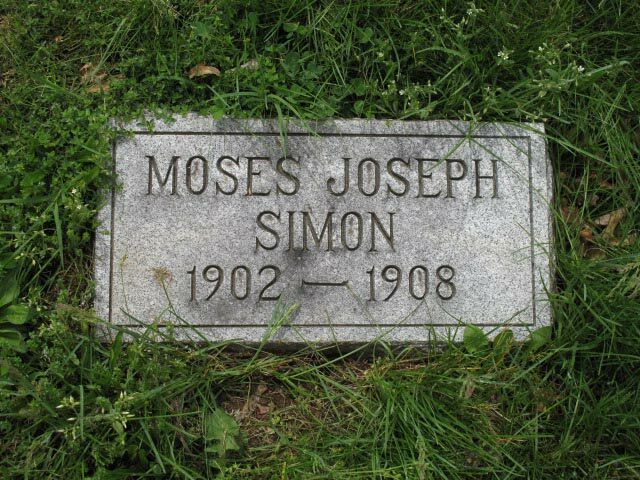 Joseph and Emilie had a son Moses Joseph Simon, born in 1902, who died in May, 1908. Unfortunately, I could not locate a death certificate for Moses, so I do not know the cause of death. All I could locate was this notice of his funeral in the York Daily newspaper and his headstone. Joseph and Emilie did not have any other children. They were members of the Hebrew Reformed Congregation in York and supporters of the local symphony orchestra. Joseph worked as a milliner in York for many years until his death in April 1928. Emilie lived another twelve years. 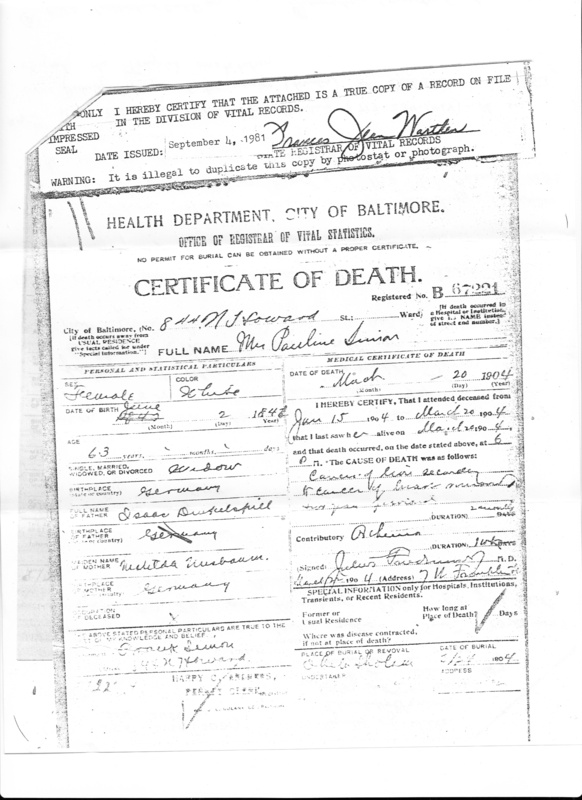 After Joseph died, she relocated to Baltimore, where she died in 1940. They were buried with their son Moses at the Prospect Hill Cemetery in York, Pennsylvania. Joseph’s younger brother Francis Simon, known as Frank, was working as a clerk in 1895, and in 1900 he was living with his mother and younger sister Nellie, still listing his occupation as a clerk. Like his brother Joseph, Frank married a woman born and raised in Baltimore, Bertha May. According to the 1930 census, Frank married Bertha when he was 40 years old and she was 34, or in 1904. They did not have any children. In 1910, Frank and Bertha were living with Bertha’s father and her sister Tillie and brother-in-law Joseph Wurtzburger and their children. Frank was working as the treasurer of a mercantile business. In 1920 Frank and Bertha were living on their own, and neither was employed. Frank was 54, and Bertha was 50. In the 1922 Baltimore directory, however, Frank is listed as being in the soft drinks business. The 1930 census again lists them without occupations. Frank died January 31, 1932, and is buried at the Baltimore Hebrew cemetery; Bertha was living with her widowed sister, Tillie Wurtzburger, at the time of the 1940 census. Her sister Tillie died in 1945, and Bertha died in June, 1951, at the age of 81. The third child of Paulina Dinkelspiel and Moses Simon was Leon Simon, born in 1866, two years after Frank. By 1895 Leon had his own company, L. Simon and Co., listed in the Baltimore directory as a cloak manufacturing company. He married Helen Wolf the following year in Harrisburg, Pennsylvania. 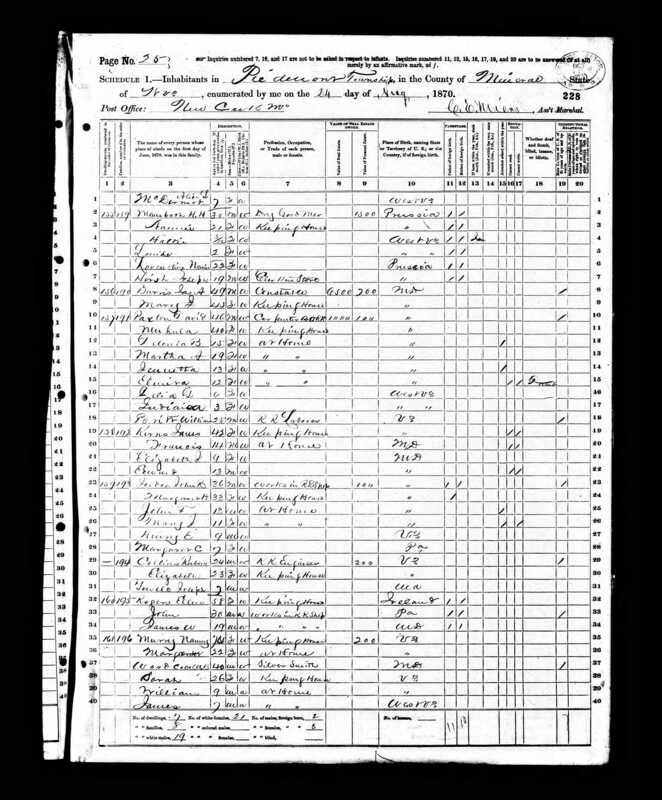 Helen was born in Harrisburg, and her father William was a real estate agent there, according to the 1880 census. Perhaps Frank’s mother Paulina had known the Wolf family when she was growing up in Harrisburg. Leon and Helen had two sons, William Wolf Simon, born in 1897, and Mervyn Moses Simon, born in 1900: the first named for Helen’s father and the second for Leon’s father, who had died the year before. Leon had no occupation listed on the 1900 census, but the 1902 Baltimore directory still listed him with L. Simon and Co. On the 1910 census, however, his occupation appears to read “General Manager Furniture Business;” in the 1914 directory, his firm name now appears as Salontz & Simon, so it would seem that his cloak business no longer existed. I found a listing in a 1904 Pittsburgh directory for the Baltimore firm of Salontz & Simon in the fur business category. The 1920 census is consistent with this, as it gives his occupation as a manufacturer of furs. In 1930 he was still in the fur business, though now his occupation is described as a fur retail merchant. The 1940 census also described him as a retail furrier. 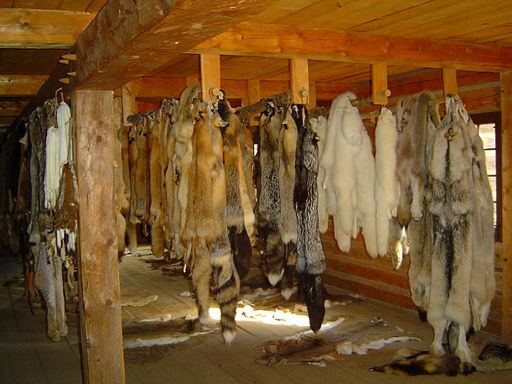 All through these decades, Leon and Helen’s two sons lived with them, and they worked in their father’s fur business once they were old enough. Neither son ever married. Leon died on August 29, 1941, and his son Mervyn died the following year on August 27, 1942. He was only 42 years old. I have ordered a death certificate for Mervyn to determine his cause of death. 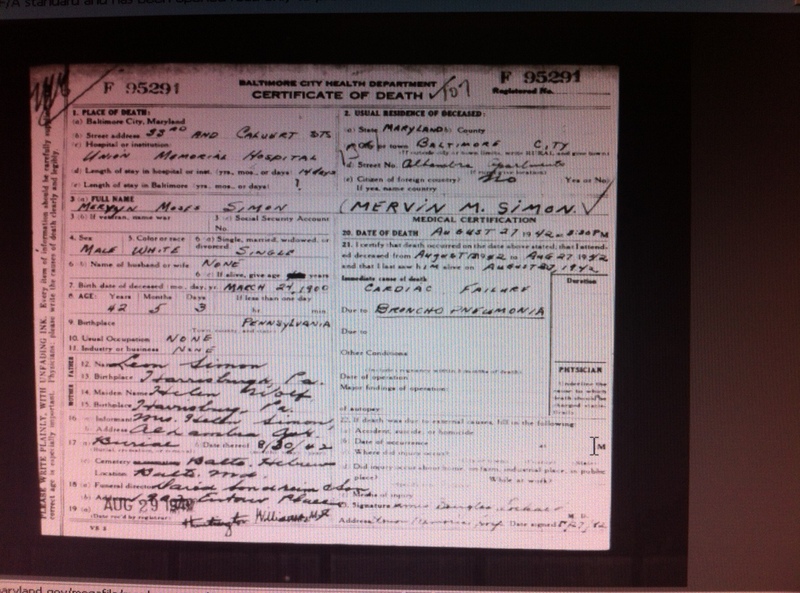 UPDATE: Here is Mervyn’s death certificate. William Simon, the older brother, continued to live with his mother at least until 1956 when both are listed at the same address in the Baltimore directory. (No occupation was listed.) Helen Wolf Simon died November 29, 1965, and William died less than a year later on October 4, 1966. All four members of the family are buried at Baltimore Hebrew Congregation. I am going to skip the fourth child Flora for now and move on to the fifth child, Nellie Simon, the one who inherited the house from her mother Paulina Dinkelspiel Simon. I had a lot of trouble figuring out what happened to Nellie after her mother died in 1904. In 1900 she had been living with her mother and brother Frank; she was 27 years old and had no occupation listed. She is also listed in the 1902 directory at the same address at 844 North Howard Street, again with no occupation listed. Since her mother bequeathed that house to Nellie when she died in 1904, I expected to find Nellie living there in 1910. 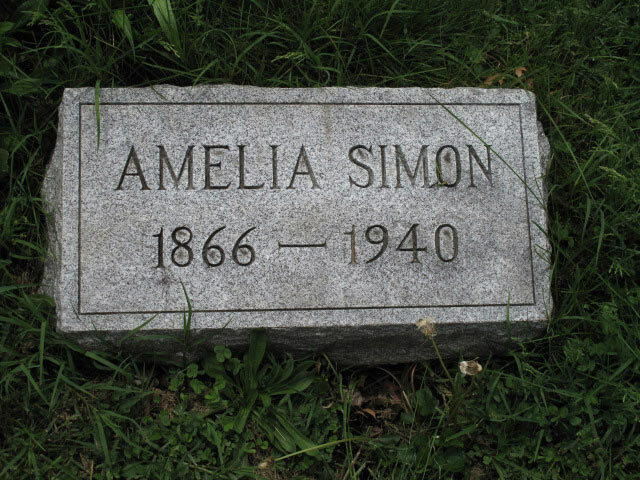 But I could not find her there, and although there was another Nellie Simon working as a hairdresser in Baltimore in the 1910s, the address was not the same. One tree on ancestry.com listed Nellie as married to an Adolph Feldstein, but I could not find any direct sources to corroborate that marriage. I was able to find Adolph and Nellie S. Feldstein on the 1910 census as well as the 1920 and 1930 census reports living in Philadelphia. The facts about that Nellie seemed consistent with my Nellie Simon: her age, parents’ birth places, and her birth place were all right, although the latter two census reports had her place of birth as Maryland instead of Pennsylvania. 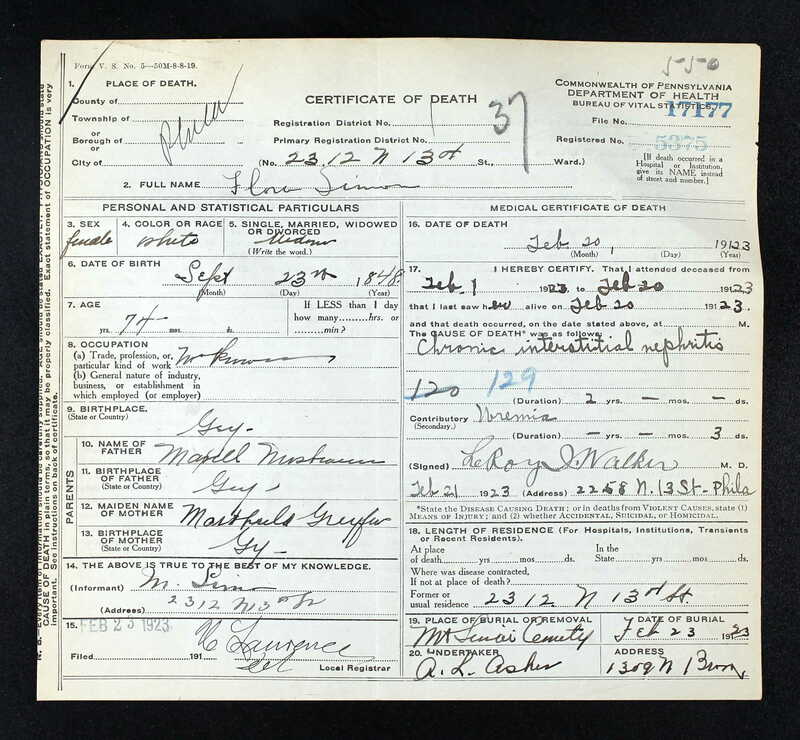 I still felt uncertain until I found a bill from the funeral home in charge of Nellie’s funeral in 1958. The document listed Horace A. Stern as the person responsible for the bill. Although at first the name did not ring a bell, a quick search of my own family tree revealed that Horace Stern was married to the granddaughter of Nellie’s sister Flora. That was enough to convince me that the Nellie who had married Adolph Feldstein was in fact Nellie Simon, the youngest child of Paulina Dinkelspiel and Moses Simon and the grandchild of Mathilde Nusbaum and Isaac Dinkelspiel. Nellie and Adolph Feldstein did not have any children. Adolph worked in his father’s business manufacturing “haircloth.” I had never heard this term before, but a quick look on the internet revealed that according to the Merriam-Webster dictionary online, it is “any of various stiff wiry fabrics especially of horsehair or camel hair used for upholstery or for stiffening in garments.” Adolph was the secretary and treasurer of the company in the 1910s, and he continued to work in the business throughout the 1920s and the 1930s until his death by suicide in 1937. As mentioned above, Nellie lived another twenty years, passing away in 1958. It’s interesting that three of these siblings were all involved in the clothing trade, although different aspects of it: hats, furs, and haircloth. (I am not really sure how Frank supported himself and his wife.) It’s also interesting that three of the five children of Paulina Dinkelspiel and Moses Simon did not have children who survived them. Joseph’s one child passed away as a little boy, and Frank and Nellie married but never had children. Leon did have two sons who grew to adulthood, but his sons never married or had children, so there were no descendants to carry on his family line. Only Flora, the remaining sibling, had grandchildren and further generations of descendants. I will discuss her and her descendants in my next post. And I am back from vacation. We had a wonderful time, and not having reliable internet access may have been a blessing. I couldn’t do any new research or posting to the blog so my brain had a chance to clear. Always a good thing. I did, however, have one more post “in the bank” that I prepared before I left, so here it is. I was awaiting a few more documents, hoping they would answer a few questions, and I received some while away that I have just reviewed. I wish I could post a somewhat more uplifting post for the holiday season, but I can’t deny the sad fact that some of my relatives suffered considerable sadness in their lives. On the other hand, researching and writing about the families of Leopold Nusbaum and his sister Mathilde Nusbaum Dinkelspiel only made me appreciate all my blessings. So in that sense it is perhaps appropriate. Nothing can make you appreciate all you have more than realizing how little others have. So here is the story of two of the Nusbaum siblings, one of the brothers and one of the sisters of my three-times great-grandfather John Nusbaum. Leopold Nusbaum had died in 1866 when he was 58 years old, leaving his widow Rosa and daughter Francis (how she apparently spelled it for most of her life) behind. Leopold and Rosa had lost a son, Adolph, who died when he was just a young boy. Francis was only 16 when her father died. After Leopold died, Rosa and Francis moved from Harrisburg to Philadelphia and were living in 1870 with Rosa’s brother-in-law, John Nusbaum. Late in 1870, Francis Nusbaum married Henry N. Frank. Henry, the son of Nathan and Caroline Frank, was born in Lewistown, Pennsylvania, where Leopold’s brother Maxwell Nusbaum and his family had once lived before relocating to Harrisburg. Henry’s father Nathan Frank was in the dry goods business, so the Nusbaums and Franks might have known each other from those earlier times. Nathan, Caroline, and their children had relocated to Philadelphia by 1870 and were living on Franklin Avenue right near the Simons, Wilers, and other members of the Nusbaum/Dreyfuss clan. Perhaps that is how Francis and Henry met, if not from an earlier family connection. Not long after they were married, Henry and Francis must have moved back to Lewistown because their first child, Leopold, was born there on August 11, 1871. Leopold was obviously named for Francis’ father. A second child, Senie, was born in May 1876, and then another, Cora, was born in 1877. 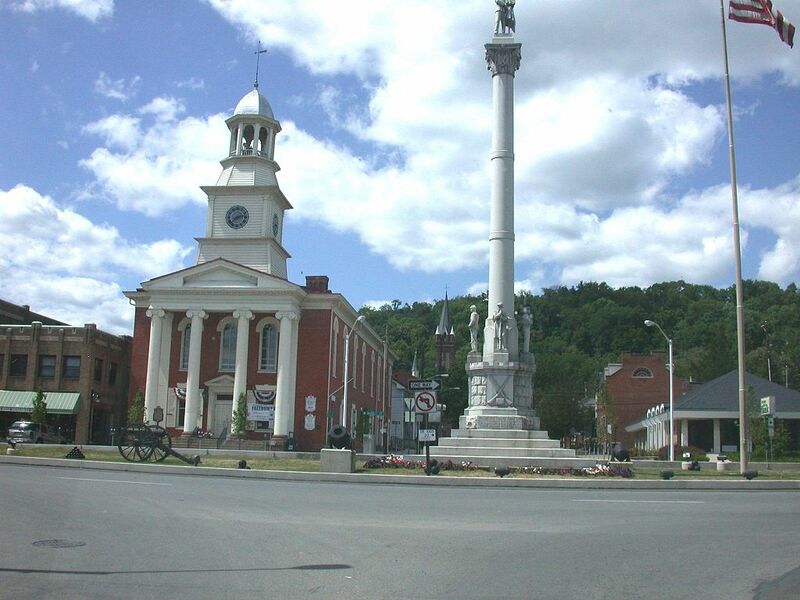 In 1880, Henry and Francis were living in Lewistown with their three young children as well as Francis’ mother Rosa and Henry’s father Nathan. Maybe Nathan was shuttling back and forth between Lewistown and Philadelphia because he is listed on the 1880 census in both places, once with Henry and Francis and then again with Caroline and their other children. Both Henry and his father Nathan listed their occupations as merchants. Unfortunately, there is not much else I can find about Henry, Francis, or their children during the 1870s because Lewistown does not appear to have any directories on the ancestry.com city directory database. Lewistown’s population in 1880 was only a little more than three thousand people, which, while a 17% increase from its population of about 2700 in 1870, is still a fairly small town. It is about 60 miles from Harrisburg, however, and as I’ve written before, well located for trade, so the Frank family must have thought that it was still a good place to have a business even if the rest of the family had relocated to Philadelphia. 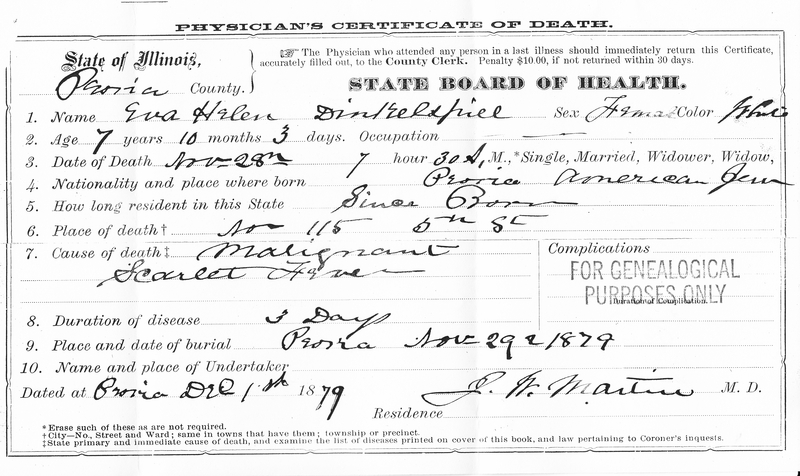 On November 28, 1879, his daughter Eva died from scarlet fever. She was not quite eight years old. Adolph and Nancy did not have other children, and this must have been a devastating loss. In fact, shortly thereafter Adolph, who had been in Peoria for over sixteen years, and Nancy, who was born there and still had family there, left Peoria and relocated to Philadelphia. On the 1880 census, Adolph was working as a clothing salesman and Nancy as a barber. (At least that’s what I think it says. What do you think?) Perhaps Adolph and Nancy left to find better opportunities or perhaps they left to escape the painful memories. Whatever took them away from Peoria, however, was enough that they never lived there again. Adolph and Nancy did not remain in Philadelphia for very long, however. By 1882 Adolph and Nancy had relocated to St. Louis, Missouri, where Adolph worked as a bookkeeper for many years. They remained in St. Louis for the rest of their lives. Adolph died on November 25, 1896, and Nancy less than a year and a half later on March 5, 1898. Adolph was only 53, and Nancy was not even fifty years old. I found two points of interest in this obituary. One, there is no mention of their daughter Eva. And two, it reveals that the Nusbaum store in Peoria had closed, prompting Nancy and Adolph to relocate. Thus, Adolph and Nancy not only suffered a terrible personal loss, like many others in the family and in the country, they were negatively affected by the economic conditions of the 1870s. Nancy and Adolph are both buried, along with their daughter Eva, in Peoria. Only death, it seems, could bring them back to Peoria. Sophia and Herman did have three other children in the 1870s who did survive: Hattie, born May 30, 1873, just seven months after Leon died; Jennie, born August 24, 1876; and Edgar, born August 27, 1879. Herman worked as a clothing merchant, and during the 1870s the family lived at the same address as the store, 435 Market Street in Harrisburg. Paulina (Dinkelspiel) and Moses Simon, meanwhile, were still in Baltimore in the 1870s. In 1870 Moses was a dealer “in all kinds of leather,” according to the 1870 census. 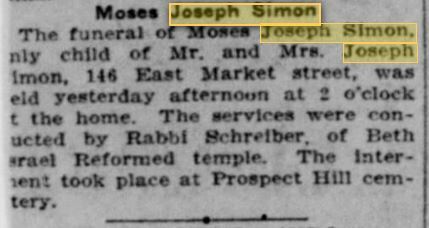 At first I thought that Moses and Paulina had relocated to Philadelphia in 1871 because I found a Moses Simon in the Philadelphia directories for the years starting in 1871 who was living near the other family members and dealing in men’s clothing. 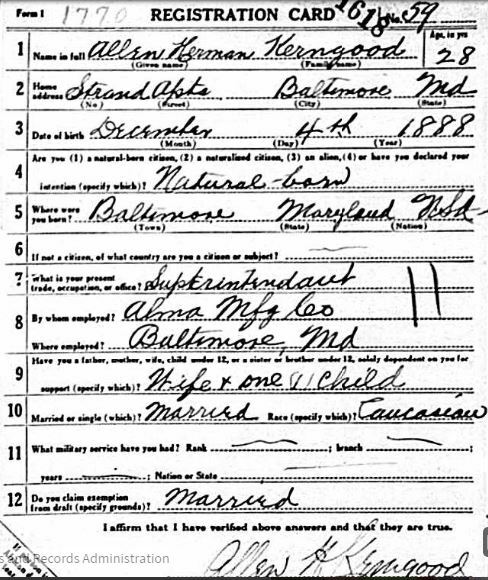 But since Moses and Paulina Simon are listed as living in Baltimore for the 1880 census and since Moses was a liquor dealer in Baltimore on that census, I realized that I had been confused and returned to look for Moses in Baltimore directories for that decade. Sure enough, beginning in 1871 Moses was in the liquor business, making me wonder whether the 1870 census taker had heard “liquor” as “leather.” After all, who says they deal in all kinds of leather? All kinds of liquor makes more sense. Thus, like the other members of the next generation, Adolphus and Simon Nusbaum in Peoria, Leman Simon in Pittsburgh, and Albert Nusbaum in Philadelphia, Moses Simon had become a liquor dealer. Moses and Paulina had a fourth child in 1872, Nellie. The other children of Moses and Paulina were growing up in the 1870s. By the end of the decade, Joseph was eighteen, Leon was fourteen, Flora was twelve, and little Nellie was eight. 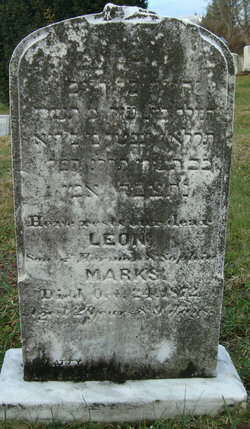 Ned Lewison, my more experienced colleague and Dinkelspiel cousin, found a fifth child Albert born in 1875 who died August 25, 1876 and a sixth child Miriam born in July 1877 who died October 30, 1878, both of whom are buried at Oheb Shalom cemetery in Harrisburg, where their parents would also later be buried. Thus, Paulina lost two babies in the 1870s. For her parents, Mathilde and Isaac, that meant the deaths of four grandchildren in the 1870s alone. As for Mathilde and Isaac Dinkelspiel themselves, although they began and ended the decade in Harrisburg, my research suggests that for at least part of that decade, they had moved to Baltimore. Isaac has no listing in the 1875 and 1876 Harrisburg directories (there were no directories for Harrisburg on line for the years between 1870 and 1874), but he does show up again in the Harrisburg directories for 1877 and 1878. When I broadened the geographic scope of my search, I found an Isaac Dinkelspiel listed in the Baltimore directories for the years 1872, 1873, 1874, and 1875 as a liquor dealer. This seemed like it could not be coincidental. 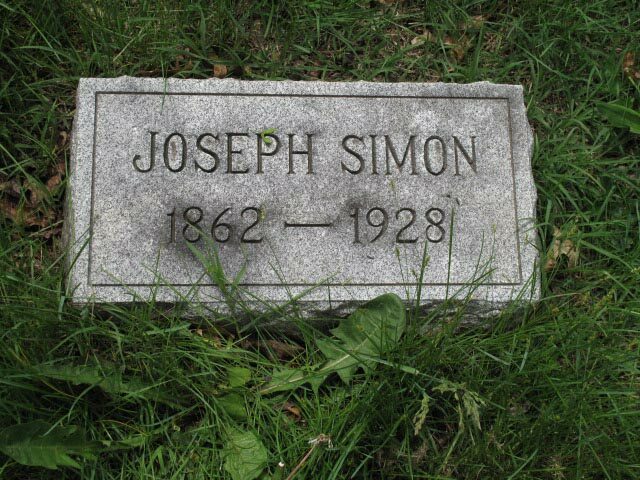 It’s such an unusual name, and Isaac’s son-in-law Moses Simon was a liquor dealer in Baltimore. It seems that for at least four years, Isaac and Mathilde had left Harrisburg for Baltimore, leaving their other daughter Sophia and her husband Herman Marks in charge of the business at 435 Market Street in Harrisburg, where Isaac and Mathilde lived when they returned to Harrisburg in 1877. The extended Dinkelspiel family as well as the Nusbaum family suffered another major loss before the end of the decade. According to Ned Lewison’s research, Mathilde Nusbaum Dinkelspiel died on June 20, 1878. Another Nusbaum sibling had died, leaving only John and Ernst alive of the original six who had emigrated from Germany to America; Maxwell, Leopold, Isaac, and now Mathilde were gone. Mathilde is buried at Oheb Shalom cemetery in Harrisburg. What happened to Isaac Dinkelspiel after his wife Mathilde died? Although Isaac appeared in the 1880 Harrisburg directory at 435 Market Street, the same address as his son-in-law Herman and daughter Sophia (Dinkelspiel) Marks, he does not appear with them on the 1880 census at that address. In fact, I cannot find him living with any of his children or anywhere else on the 1880 census, although he is again listed in the Harrisburg directory at 435 Market Street for every year between 1880 and 1889 (except 1881, which is not included in the collection on ancestry.com). 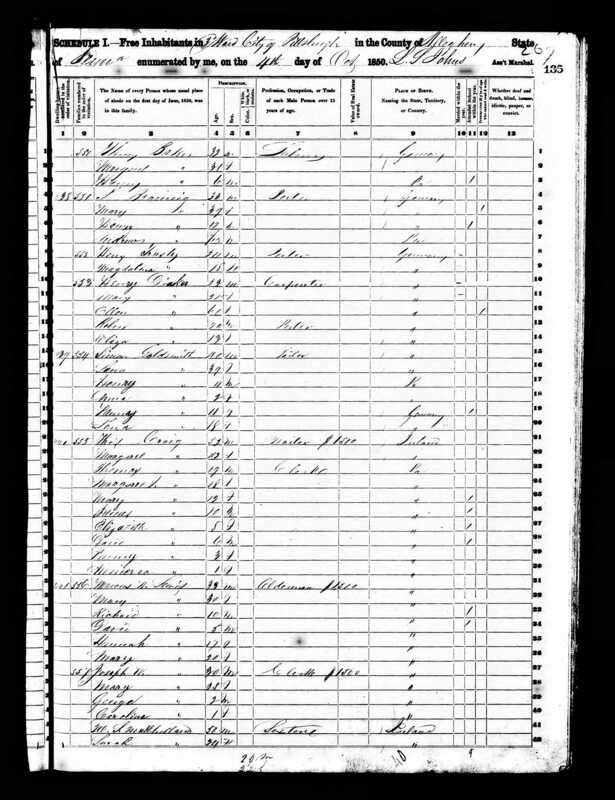 I assume the omission from the census is just that—an omission, and that Isaac was in fact living with Sophia and Herman during 1880 and until he died on October 26, 1889, in Harrisburg. He is buried with his wife Mathilde at Oheb Shalom cemetery in Harrisburg. Thus, the Dinkelspiels certainly suffered greatly in the 18070s. Five children died in the 1870s—Eva Dinkelspiel, May Marks, Leon Marks, Albert Simon, and Miriam Simon. 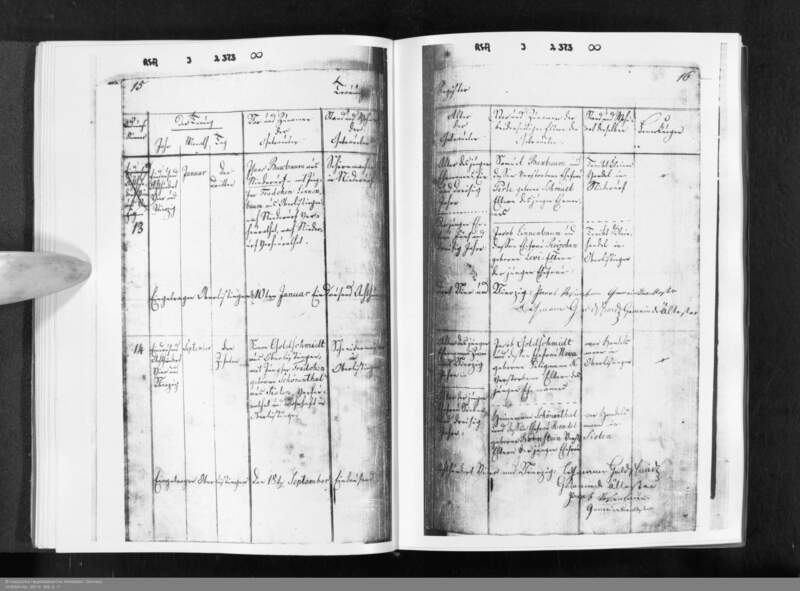 And their grandmother, Mathilde Nusbaum Dinkelspiel, also passed away, joining her brothers Maxwell, Leopold, and Isaac, leaving only John and Ernst left of the six Nusbaum siblings who left Schopfloch beginning in the 1840s to come to America. And so I leave you with this thought as we start looking forward to a New Year. Don’t take your children or your grandchildren for granted. Cherish every moment you get to share with them. And be grateful for modern medicine and the way it has substantially reduced the risks of children being taken from us so cruelly.